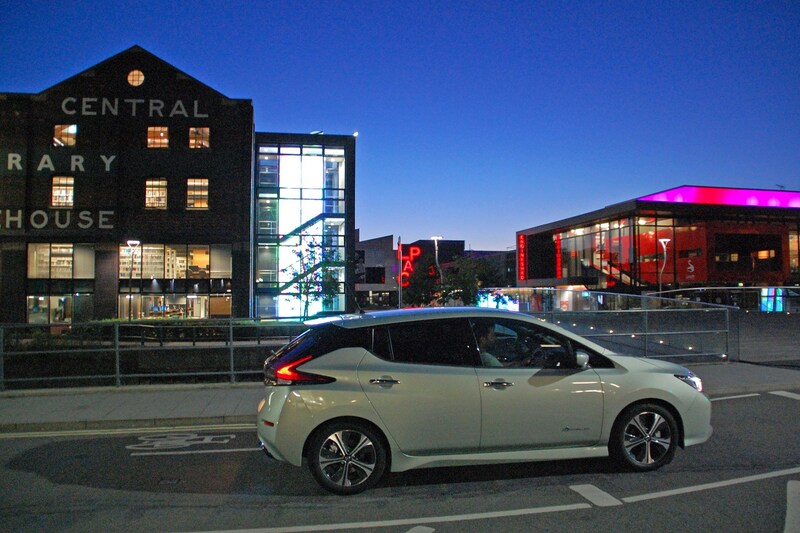 Can the Leaf persuade an EV newbie of its virtues? 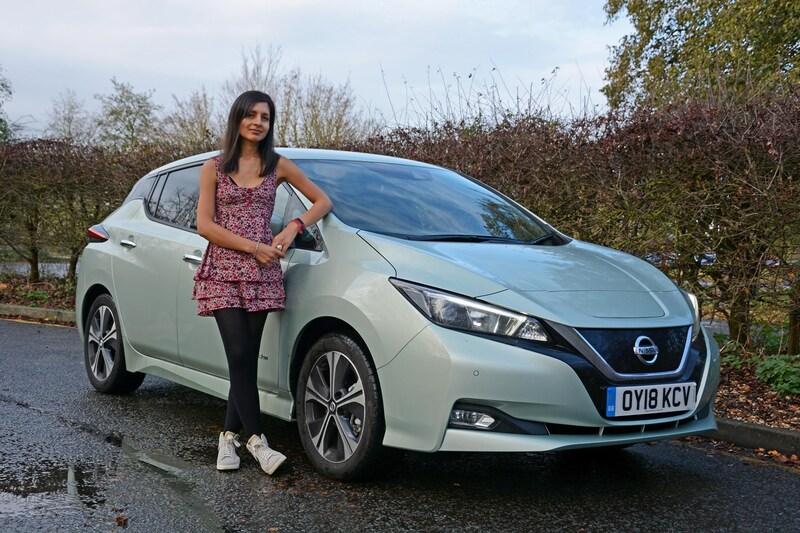 This week’s update: Foodie Sheena swaps her punch VW Golf R for our Leaf. Will she be won over by its zero-emission charms and embrace EV motoring? 4. Drive time 5.#LeafLapsLincoln 6. EV convert? 7. Enthusiast challenge 8. Good Leaf! 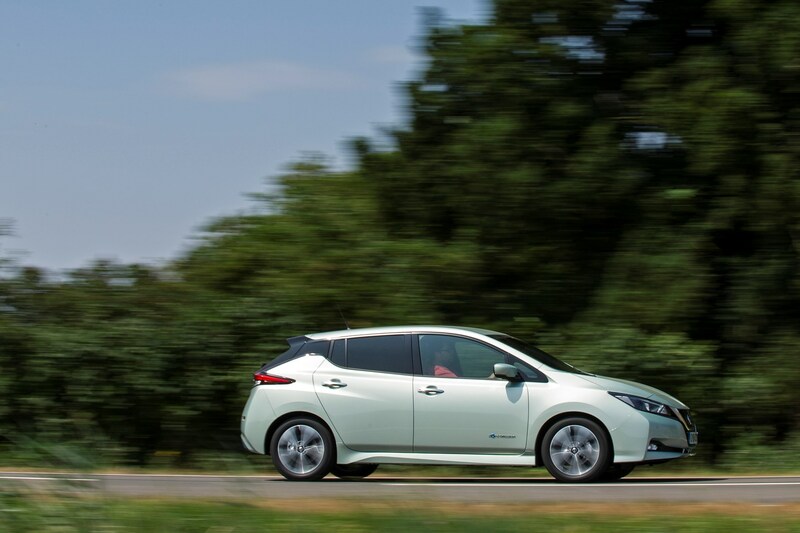 Here’s a question: given my 76-mile each-way commute, is a Nissan Leaf a viable proposition? 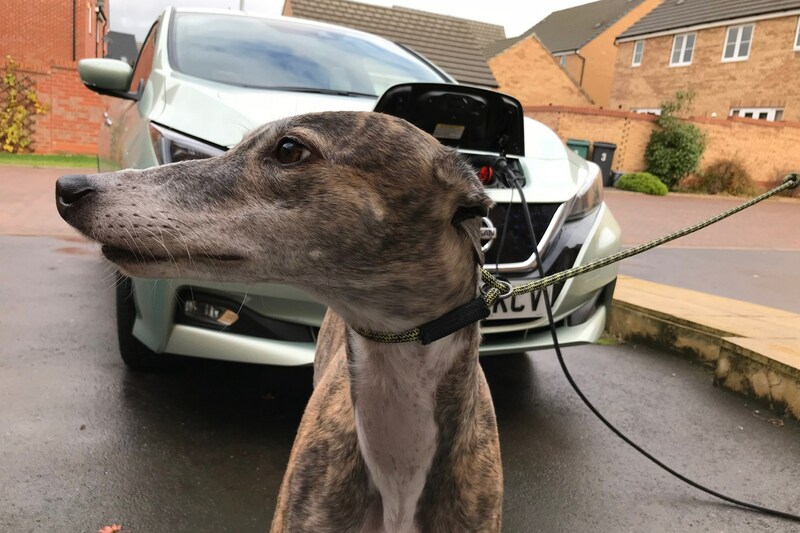 Over the next six months I’ll be answering that – and numerous other queries that will inevitably occur – as I find out how easy it is to live with the electric Nissan as my daily driver. 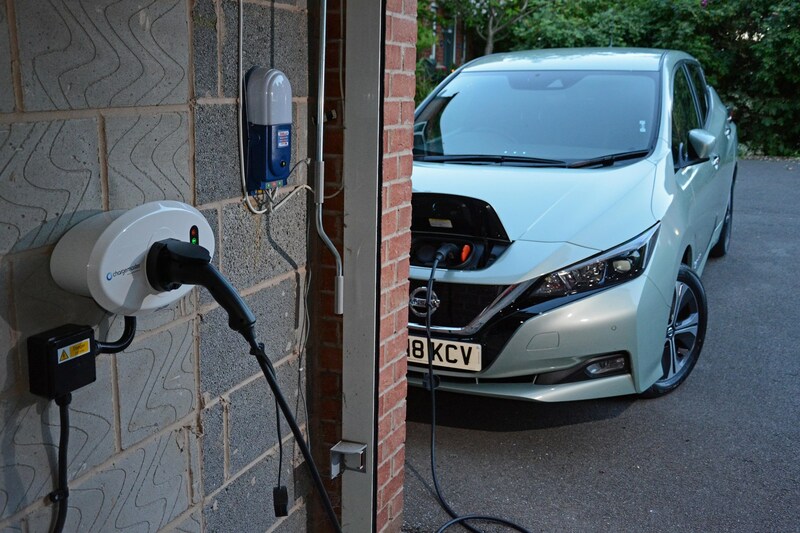 Will the Leaf and I be living together in electric dreams or will range anxiety give me the EV-jeebies? Isn’t it a bit, you know, boring driving an electric car? 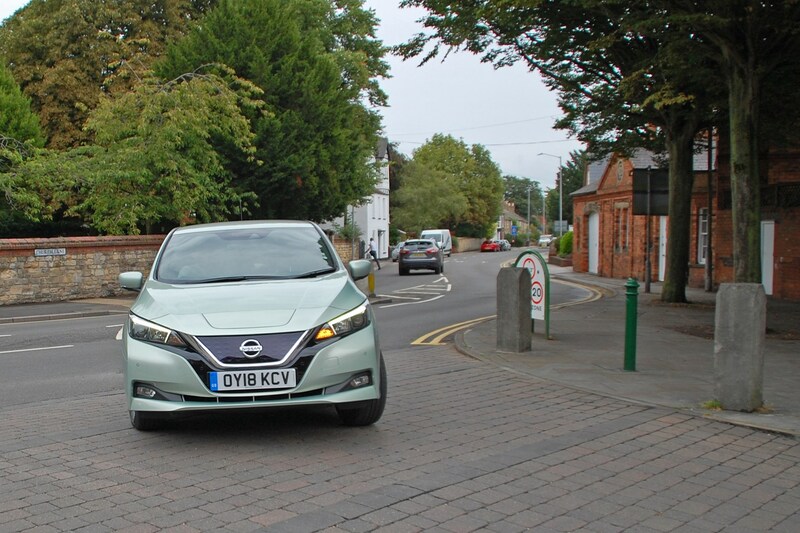 Driving any battery electric vehicle (BEV) is a different experience from being at the wheel of a conventional petrol- or diesel-engined car, and the Leaf is no exception. But boring? Nah. Producing 320Nm of torque as soon as your foot caresses the accelerator and generating 150hp all the way up to a heady (and precise!) 9,795rpm, the Nissan’s no slouch, posting a 7.9-second 0-62mph acceleration time. Top speed is governed – to prevent needless battery wastage – at 89.5mph. 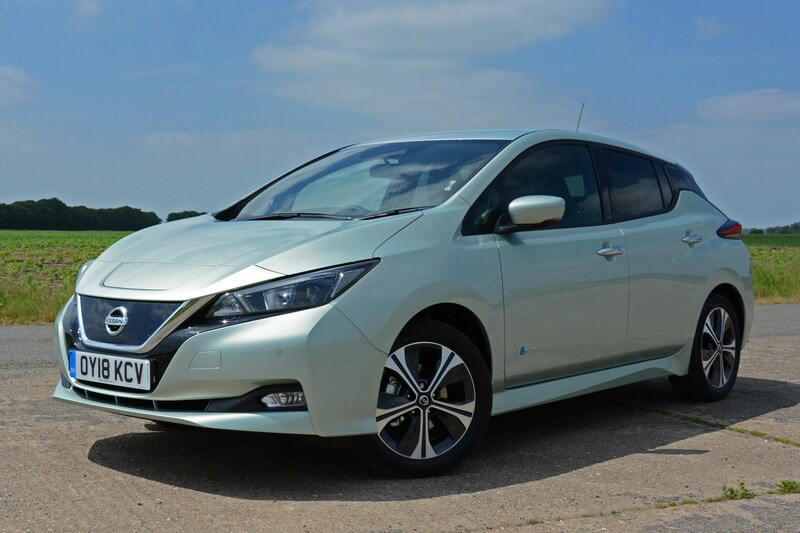 What specification is Parkers’ long-term Nissan Leaf? 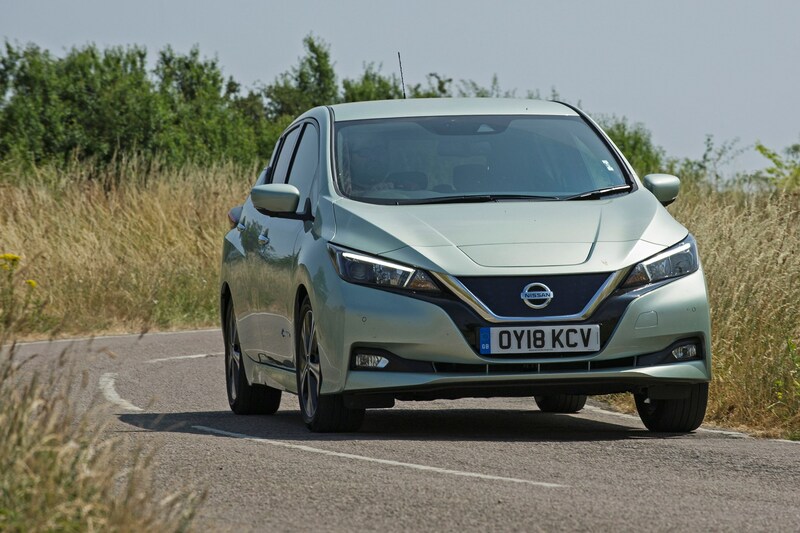 Of the four regular trim levels in the Leaf hierarchy, the one-rung-from-the-top N-Connecta is expected to be the best seller, hence why we’ve picked it for our long-termer. According to the brochure, that weighs in at £31,390, but as the government’s plug-in car grant discounts that by £4,500, the retail price is £26,890. That’s still significantly more expensive than your common-or-garden petrol- or diesel-sipping five-door family hatchback, but the theory is that you’ll make a huge saving in running costs to offset the initial costs. We shall see. I’ll explore the intricacies of the N-Connecta’s kit roster in a future update, but externally the only difference between it and flagship Tekna is the latter’s full LED headlamps in place of the N-Connecta’s halogen projectors – it certainly doesn’t look the poor relation, though. 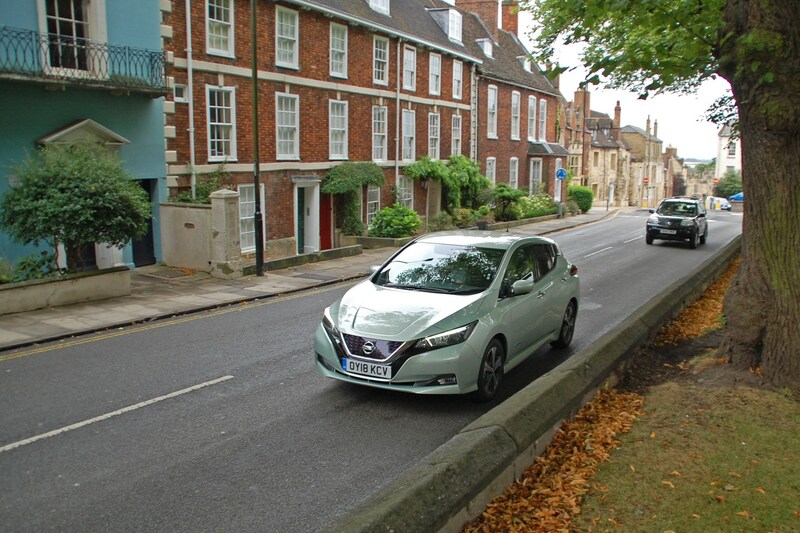 Options-wise the Parkers Leaf has but two – the Nissan’s one of those cars where if you’re too enthusiastic ticking-off the extra-cost niceties, you may as well progress to the next trim level up anyway. At £575 the unusual Spring Cloud metallic paint – it’s a pale, silvery green with a mid-1980s vibe to it – brings a welcome change to the usual light blue, pearly white and dark metallic greys that many Mk1 Leafs seem to be painted. The additional £400 charge for the ProPilot adaptive cruise control seems good value, providing it works as well as promised – I’ll explore that in more detail in the weeks to come. 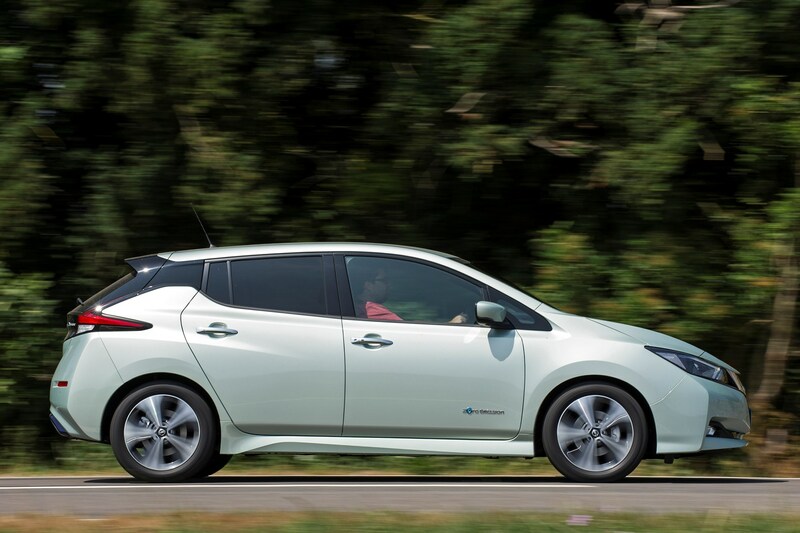 How far will the Nissan Leaf go between charges? 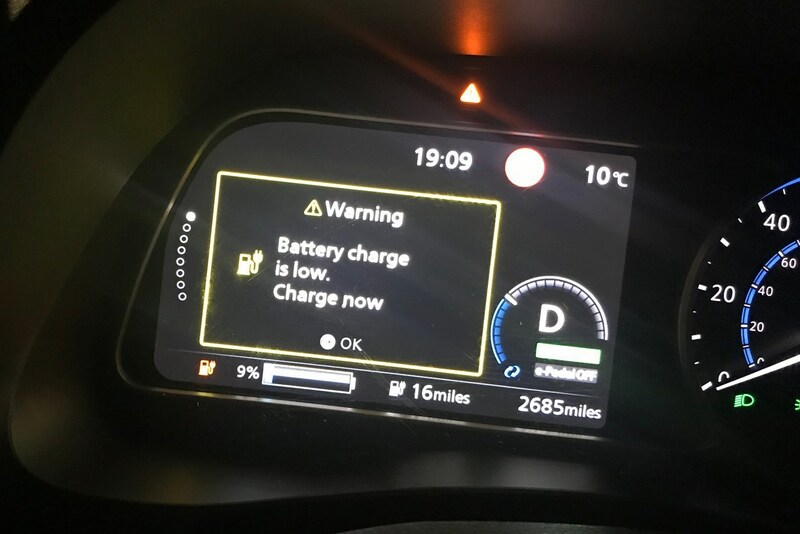 There’s a lot made of range anxiety – the worry caused by the thought of being stranded with a flat battery with nowhere convenient to charge-up again – but after a few miles driving the Leaf you soon learn to glance at the power reserve gauge as infrequently as you would the fuel readout in a regular car. In reality that shouldn’t be a problem for most people. If you’re buying a new Leaf you’ll receive a grant to cover the cost of installing a home-charger (something I’ll detail in the next update), meaning that if it’s plugged in overnight it’ll be a rare occurrence that you leave home without the batteries at 100% capacity. 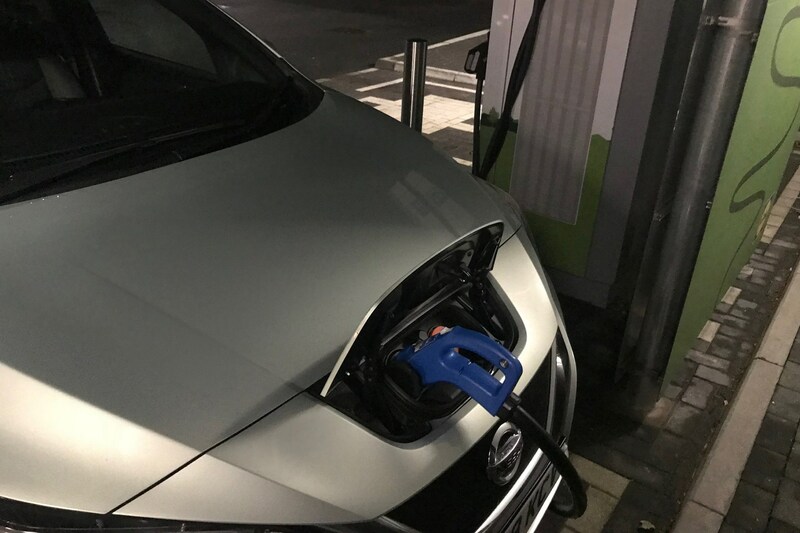 Public chargers (and those at the workplace if you’re fortunate enough to have such facilities) can then be used to replenish the electricity reserves for longer journeys. So how far can it go? 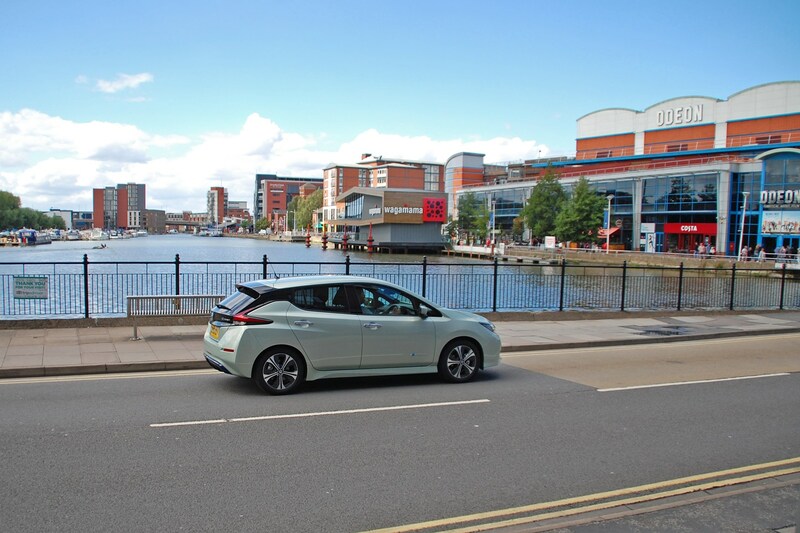 Under the new WLTP efficiency testing regulations, driving your Leaf exclusively around town should allow for up to 242 miles of driving between charging. If you’re an urban dweller and rarely venture out of the city, you might find that plugging in is a rarity. 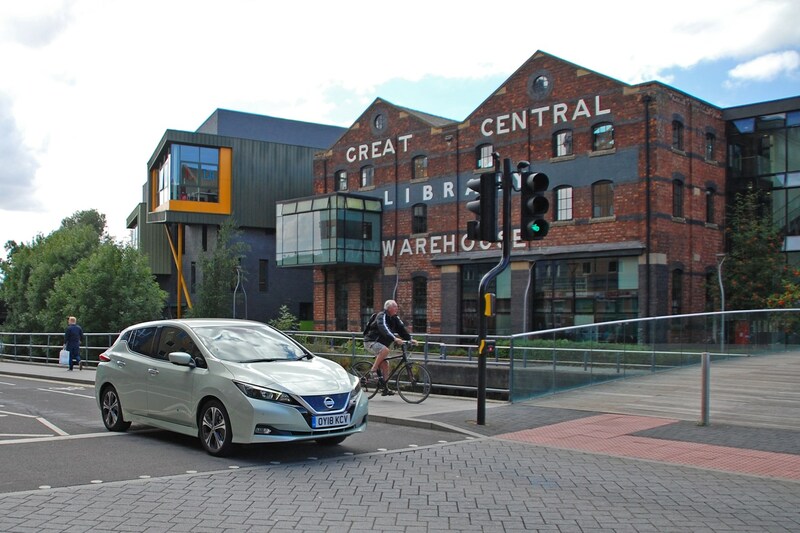 On the combined WLTP cycle – a mixture of city and higher speed driving – the Nissan’s claimed range drops to 168 miles. 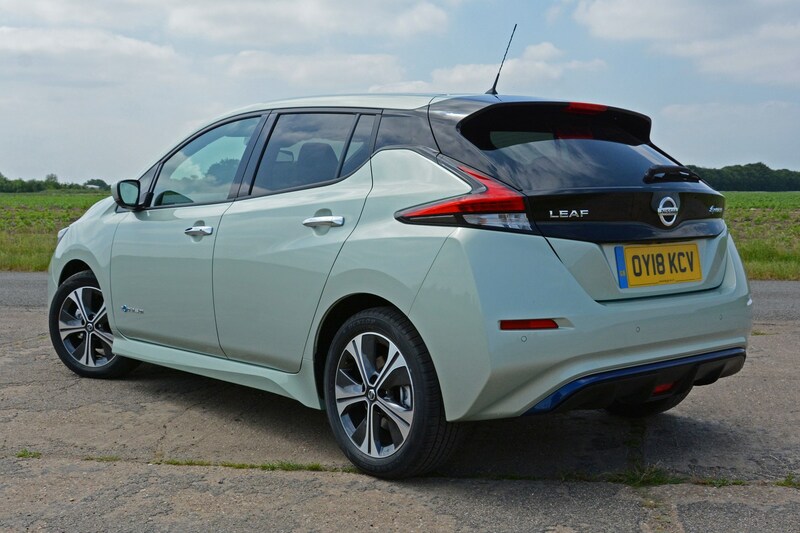 Now, we’re used to petrol- and diesel-engined cars being someway shy of their official claims, but the Leaf is so far proving itself to be close to the mark. Despite much of my 76-mile run to and from work being on dual carriageways, my first attempt to drain the Leaf’s batteries resulted in a distance of 163.1 miles covered with 1% of indicated range remaining. 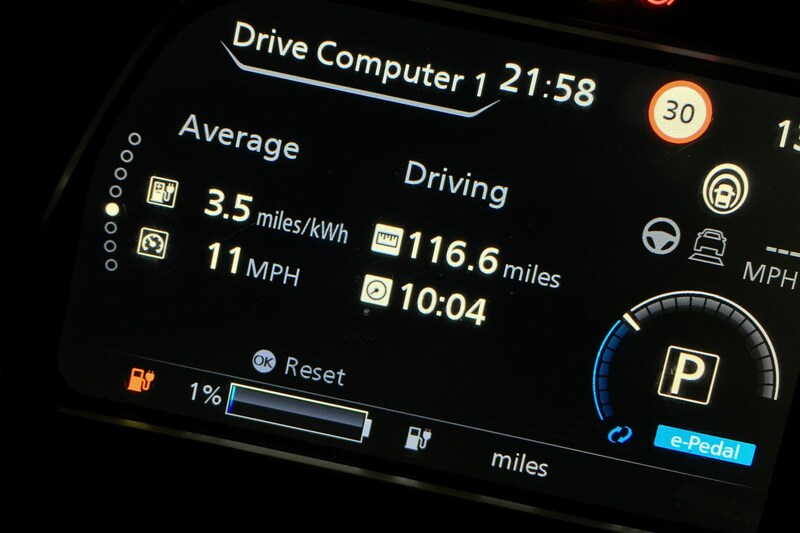 Assuming that remaining 1% of charge enabled a total distance of 164.7 miles, that particular run equated to 98% of the claimed range figure. Very impressive and, what’s more, it makes it more predictable for planning longer journeys. How much does the Nissan Leaf cost to run? This will be constantly answered and revisited over my half-year with the Leaf, but again the initial signs are incredibly promising. Obviously, the exact cost will vary on a number of parameters, not least whether you use free charging in public places, and on the kilo-Watt hour (kWh) cost of your domestic supply. For the sake of ease, my domestic tariff of £.012 per kWh is being applied to all recharges, simply to reflect that most electric car owners only charge-up at home the vast majority of the time. 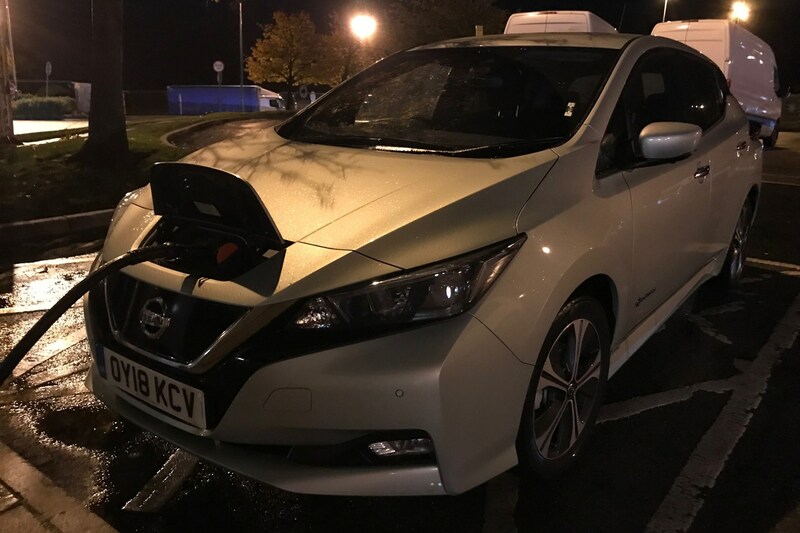 In its first week with me, the Leaf covered 500.7 miles, using 146.4kWh in the process, resulting in an average of 0.30kWh/mile, compared with the official claim of 0.33kWh/mile. Get used to kWh/mile – it’s the electric car equivalent to mpg. Those mathematicians among you will have already worked out that (rounded-up), that’s just £0.04p per mile, or put another way, £17.57 to cover 500 miles. You know what, one week in, I think I’m an EV convert. All the Leaf’s got to do now is keep impressing me over the next 25 weeks. 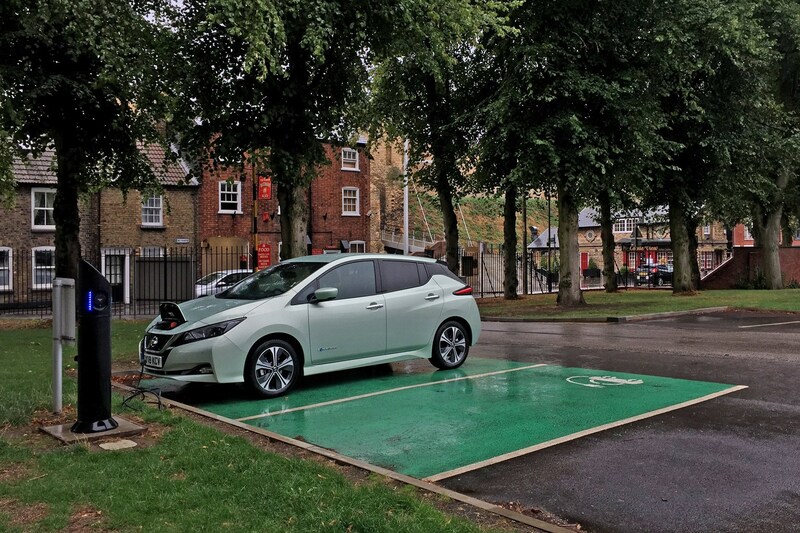 One drawback to running a fully electric car, such as Parkers’ long-term Nissan Leaf, is the inconvenient truth that recharging the batteries takes a long time compared with refilling a fuel tank with petrol or diesel. 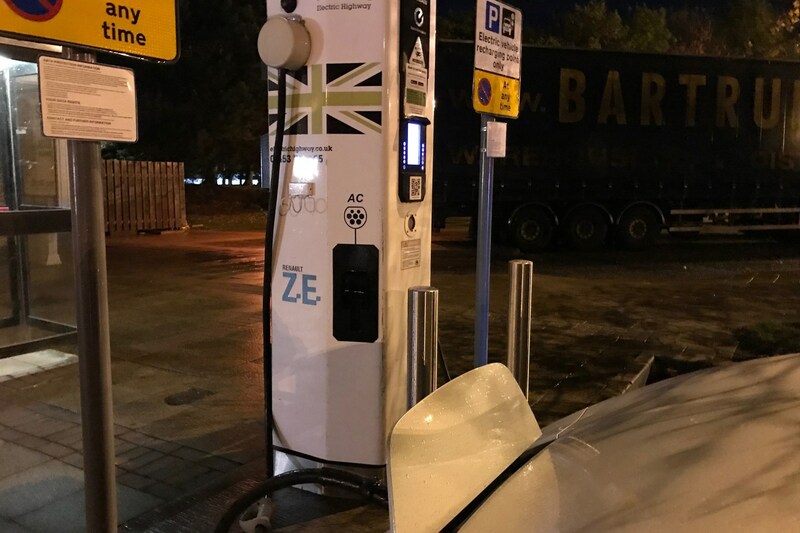 Various apps will advise of the locations of rapid chargers where around 80% of the battery reserves can be replenished in under an hour, but it’s rare that these are located near where most of us live or work. More often than not they’re at motorway services, with the express purpose of helping people complete long journeys in a timely fashion. In reality, most battery electric vehicle (BEV) drivers recharge overnight at home, and the best way of doing that is via a dedicated wallbox. How do you get a home-charger wallbox installed? 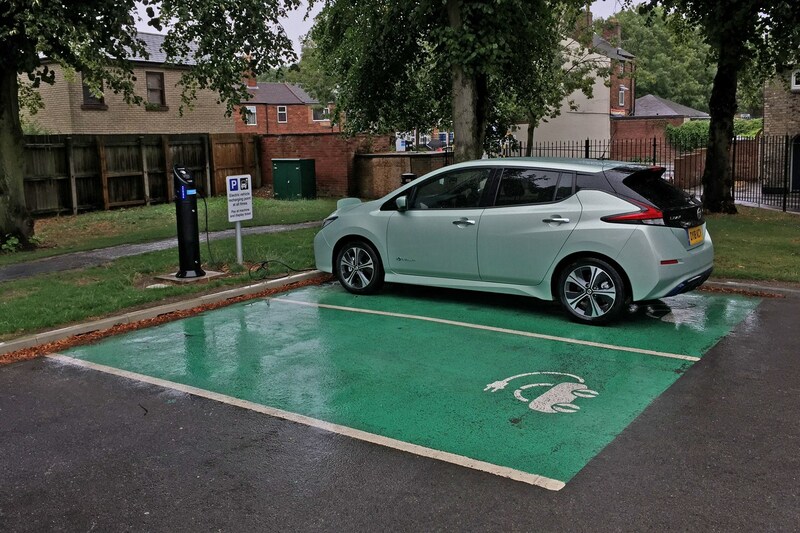 Buy a new plug-in car and, as well as a government grant to reduce the purchase price of the vehicle itself, there’s funding to cover the cost of installing a dedicated domestic charge point. 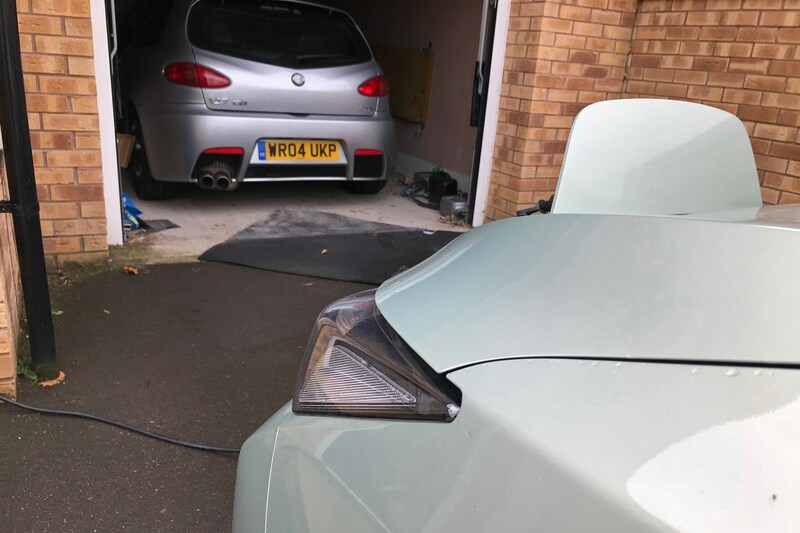 You can, of course, plug your car into a conventional three-pin domestic socket, but the flow of electricity is so slow that for the Leaf it will take the best part of a day to recharge from flat. 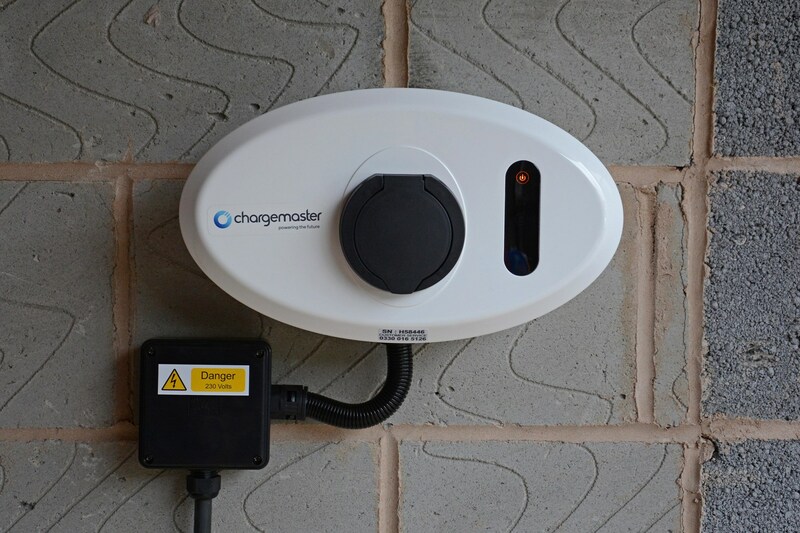 Most plug-in cars employ a Type 2 connection for domestic wallboxes – allowing a flow of up to 7kWh, the maximum allowed for a home connection. This means a sub-seven-hour recharge for the Leaf. 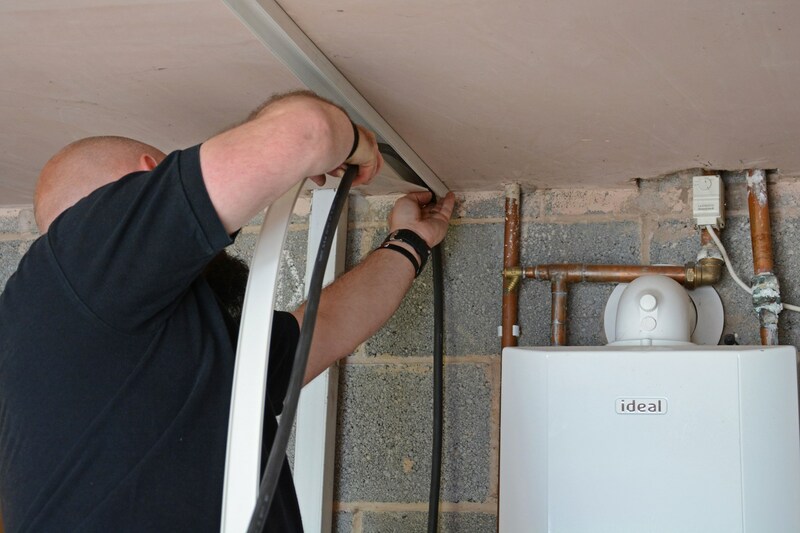 You can pay to have a wallbox installed should you wish, with costs typically ranging from £850 to £1,250 including parts and labour. What does the wallbox installation involve? Different car companies work in conjunction with different service providers – in Nissan’s case, it’s BP Chargemaster. 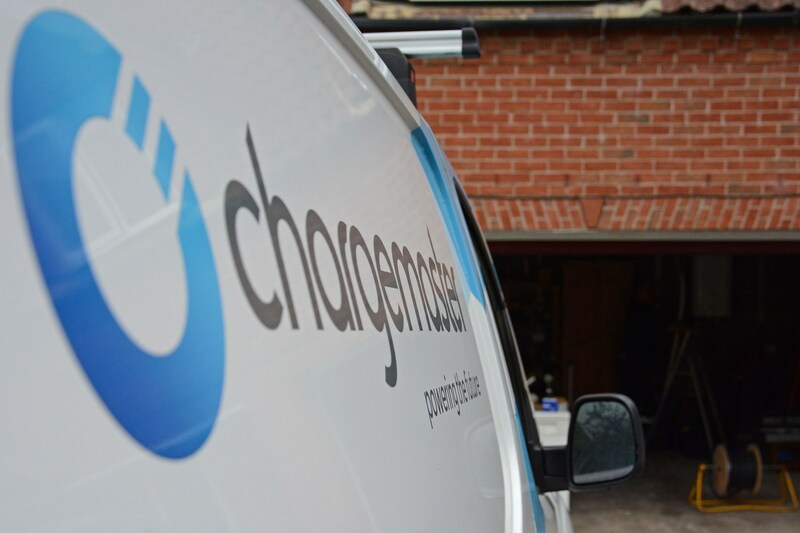 Appointment booked a week in advance, Andy the installation electrician from BP Chargemaster arrived at the allotted time to conduct a site survey. Thankfully, this was a pain-free process and amounted to little more than checking the consumer unit in the garage to ensure it had a free slot for the wallbox charger to be wired into, followed by a discussion about where to place the unit itself. Can the wallbox be placed anywhere you want it? Within reason. I opted to have mine located just inside my garage door, but according to Andy most installations are outdoors. 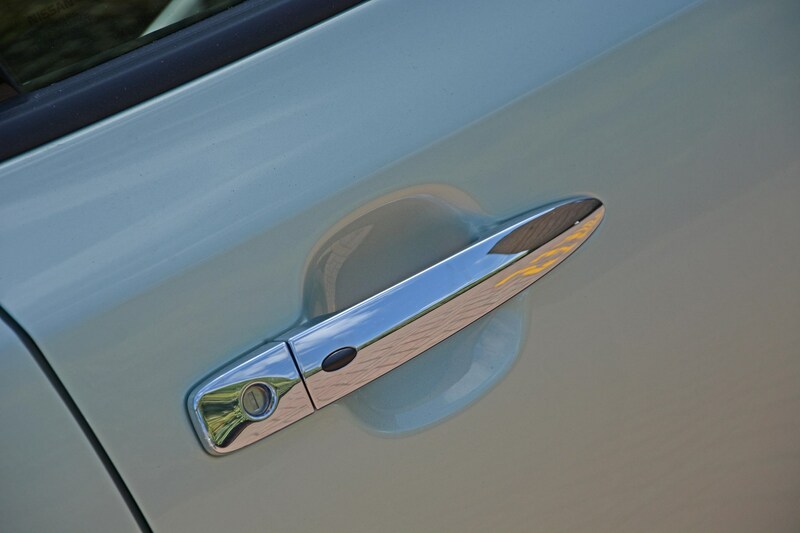 For extra security, a locking mechanism can be fitted to outdoor ones to prevent unwanted unpluggling. Essentially, so long as it’s attached to an appropriately sturdy wall and you either own the property or have the landlord’s permission to install it, there shouldn’t be much difficulty. 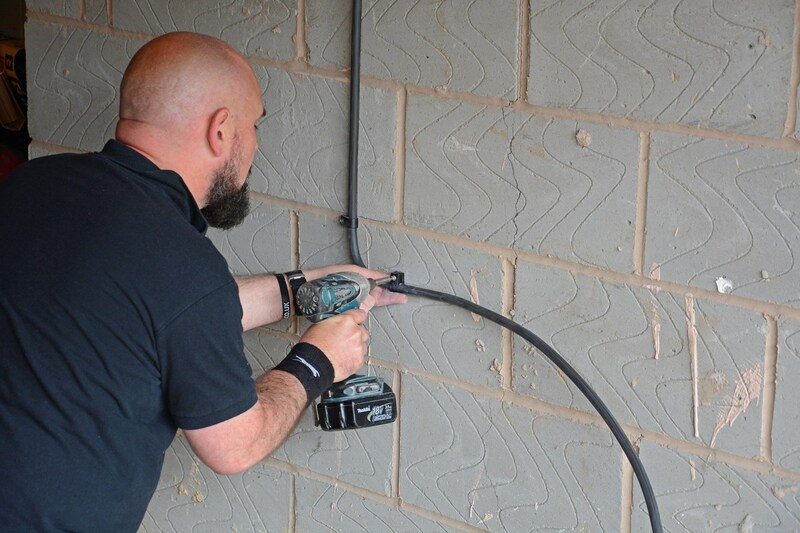 BP Chargemaster allows for 15 metres of cabling between the consumer unit and the wallbox within the cost of the installation – any further than that is charged for. Is it a complicated installation? A combination of my layman’s perspective combined with Andy’s expertise conspired to make it look very straightforward. Once the cabling is connected up to the junction box by the wallbox, it’s then wired in to the consumer unit. It’s only at this point that the electricity is turned off to the rest of the property. Ensure you notify people indoors of this beforehand to prevent hollers of ‘Daaaaaaaaaaaaad! I was in the middle of a game!’ and other such complaints. As soon as the wiring’s completed and the power’s back on, the wallbox performs an initialisation sequence and it’s ready to be used. Albeit on a chunkier scale, it’s no different to installing a new electrical spur for something like a summerhouse in the garden. Or, as we call them in the North, a shed. Just under three hours later and the installation was complete and Andy’s kit and caboodle was packed back in his van. Was there any trepidation the first time the Leaf was plugged in? Not at all. In fact, the process was almost as painless as charging-up a mobile phone, albeit with a heavier cable. That first night I kept tabs on the Nissan EV app to check how progress was going with the recharge having plugged it in just before 18:30. By the time I’d got my pyjamas on and brushed my teeth around midnight it was already back up to 100%. So far, the easiness of life with an electric car continues to impress. 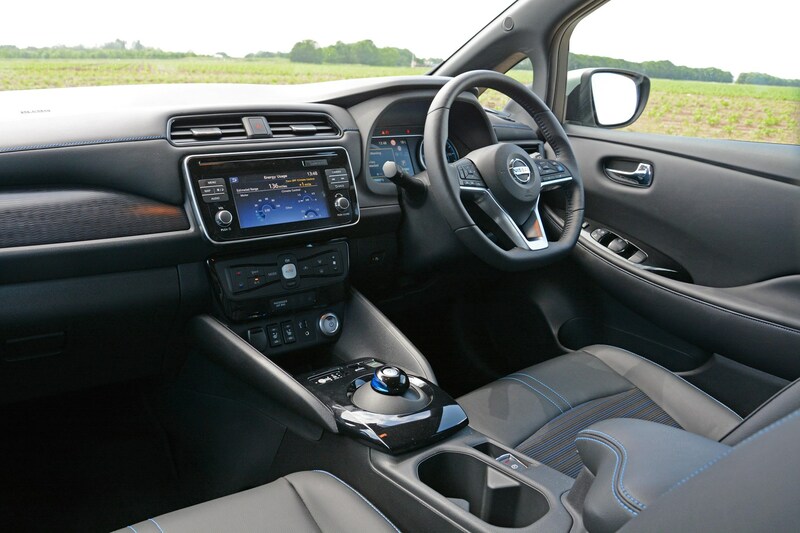 One aspect of writing car reviews that never fails to fill me with joy is wasting hour-upon-hour – sorry, researching – using configurators to virtually build desirable combinations of paintwork, interior trim and extra-cost options. Not only does it help me become familiar with a new long-term test car weeks before it arrives in the office, on a more personal note it reminds me of my childhood. Back in the 1980s I’d while away time poring over car brochures deciding on my ideal specification mix for all manner of cars that you seldom see these days, strategically leaving the catalogues open on particular pages in the hope my old man might notice the appealing leather interior of a Nissan Bluebird Executive, for instance. After all, I simply had to go top-spec. Indeed it isn’t, but long gone are the days when you had to go to the pinnacle of the line-up to get your hands on the most desirable kit available. N-Connecta also represents what is likely to be the most popular derivative of Leaf available – on the four-rung ladder of specifications, it’s one-down from Tekna at the top. It maybe sounds like advertising spiel to say that there’s too much equipment on the Leaf N-Connecta to list, but it would be a tad tedious to scroll through a seemingly endless torrent of bullet points. That amounts to a £1,500 price increase for the flagship Leaf, but it’s worth noting that if you only fancied the LED lights and ProPilot driver assistance system, they’d only add £750 to the N-Connecta’s £26,890 asking price (after the £4,500 government grant for plug-in cars has been deducted). 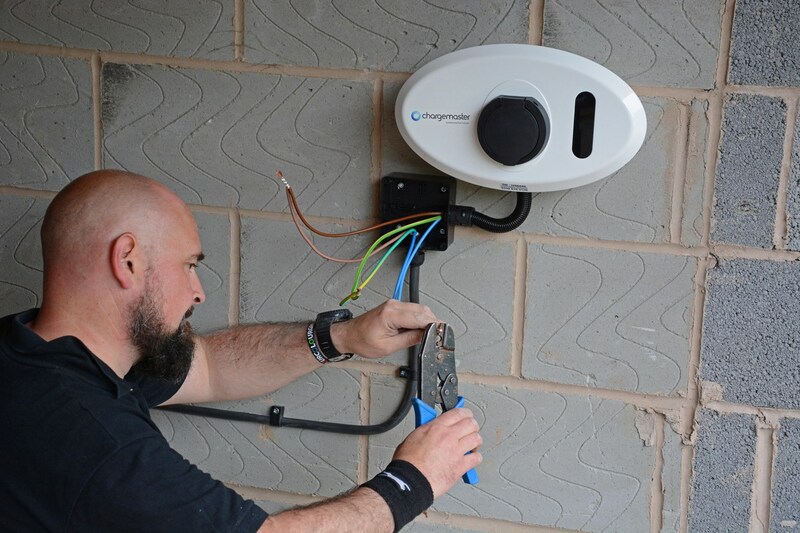 What options does our Leaf N-Connecta have fitted? 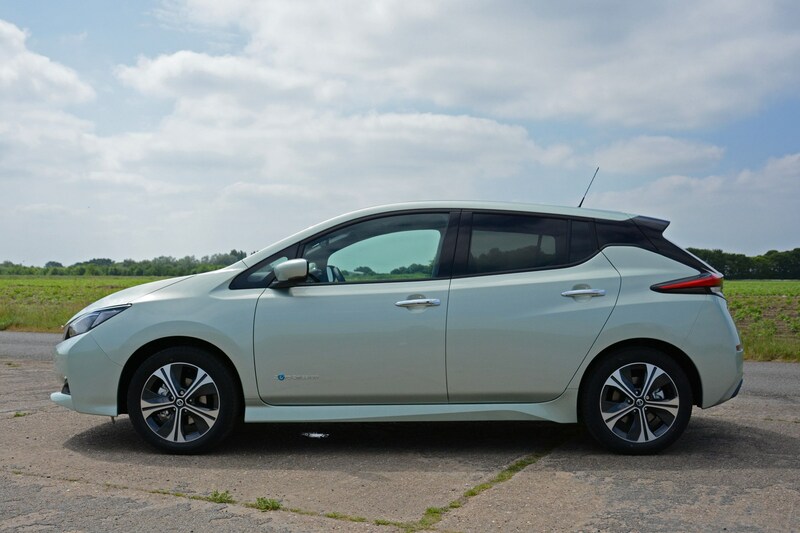 Other than the ProPilot system – which will be covered in-depth in a future review – the only other extra-cost feature our Leaf has is the Spring Cloud metallic paint. Not my personal choice, you understand, but it does make it more distinctive alongside the more popular whites, greys and reds. Me? That there’s a colour called Chestnut Brown metallic is all you need to know. Does it make for an enticing package? You know what, it does. Sure, I’d have preferred it to have the full LED headlamps, but for a total on-the-road price of £27,865 after the government’s plug-in car grant has been deducted, it feels like a fine value-for-money package. Naturally, it’s more expensive than a similarly-specced petrol- or diesel-engined hatchback, but with electricity costs comfortably hanging around 3p per mile – with the likelihood they’ll get lower still – I’m fully on-board with running an electric car. Update 4: A shockingly good drive? You’re familiar with the premise of the American gameshow ‘Jeopardy!’, right? If not, the theme is that contestants are presented with an answer and they have to guess the question. With that theme in mind, if I said the answer is ‘how far will the Nissan Leaf go between recharges?’ (and yes, I realise that answer is a question…) what would the question be? If you guessed ‘what’s the question I’m most frequently asked about our long-term Leaf by friends and neighbours?’ you’ll be feeling pretty smug right now. But prepared to be disappointed. So, does it drive like a ‘normal car’? Without delving into the realms of armchair philosophy, it depends on how deep one drills into this question. Essentially it’s like any petrol- or diesel-engined automatic car: you select D on the transmission control, depress the accelerator to go forwards and the brake to slow to a stop. Steering, sensibly, is still activated by a wheel. Doesn’t sound overly exciting or sci-fi, but it does allow cautious customers to switch to an electric car without being alienated. Okay, what’s different from a ‘normal car’ then? Let’s start with that drive selector for the transmission, which feels more like a computer mouse to use than a gearlever. The transmission itself just has a single gear – thanks to the instantaneous torque of the electric motor additional ratios would be superfluous to requirements. Selecting D (for Drive) is straightforward enough, but there’s also a forward-travelling optioned called B (for Braking). This adds a degree of brake-energy recuperation when you lift-off the accelerator, but it’s not true one-pedal driving. For that experience you need to turn on the E-Pedal (which confusingly is a button). Once activated the accelerator pedal works like a two-way switch: press down to go and lift-off to slow. 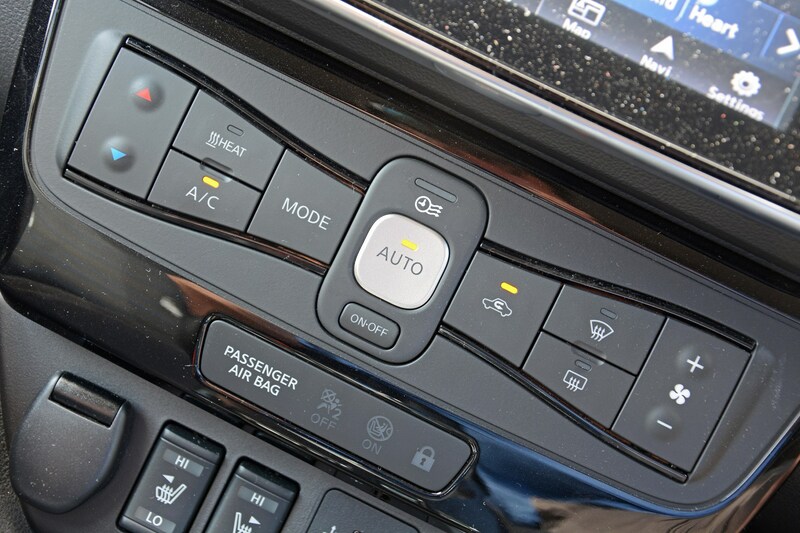 With a little time behind the wheel you can modulate the power of the braking effect to drive it around without touching the brake pedal itself – even coming to a standstill. But you’ll need to practise, especially at slower speeds, as the brakes are keen to say the least. 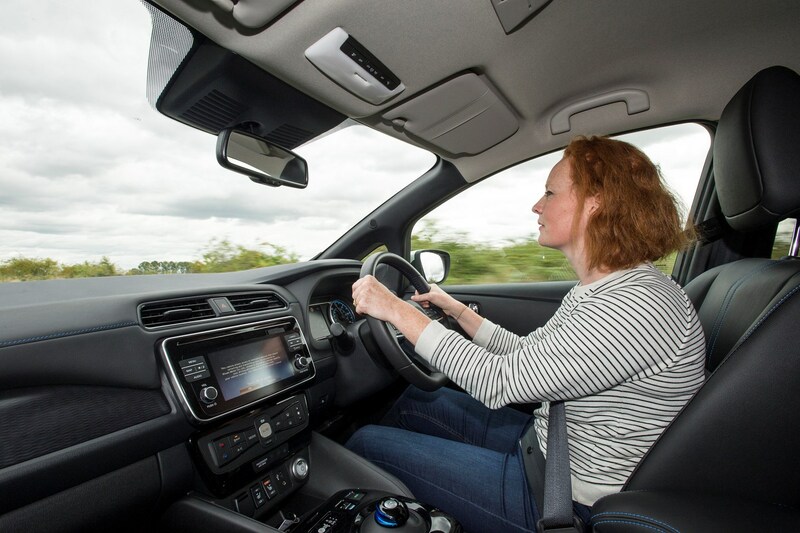 Does the conventional brake pedal take some getting used to? It does, but not for the same reason. In fact, by comparison, pressing the brake pedal is a little disconcerting if you’re endeavouring to scrub off speed quickly. As the brakes are also used to recover otherwise wasted energy to convert into electricity, there’s little perception of slowing down when you first call upon them – it’s a completely different feel to when you use the E-Pedal. Consequently, there’s a tendancy to then press even harder, with close to emergency stop-levels of pressure on the pedal. That there’s precious little sensation through the pedal doesn’t help matters – once you can master it, it’s far more satisfying to E-Pedal the Leaf everywhere you can. How does all the torque help acceleration? For me, this is the best bit, primarily because the uninitiated expect electric car drivers to dawdle everywhere. 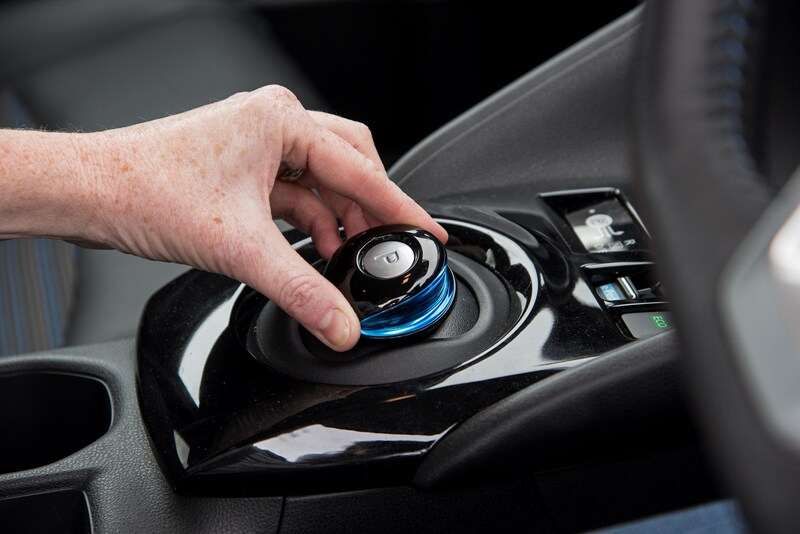 Put it this way, being held at traffic lights alongside another car often results in a Leaf ‘win’ courtesy of its sprightly 0-62mph time of 7.9 seconds. Only hot hatches, luxury saloons with big diesels and Mercedes Sprinter vans seem to be able to school it. It also helps with overtaking manoeuvres, particularly on single-carriageway roads where you have to pick your moment carefully. In this regard the Nissan is rewardingly assured. And brisk. 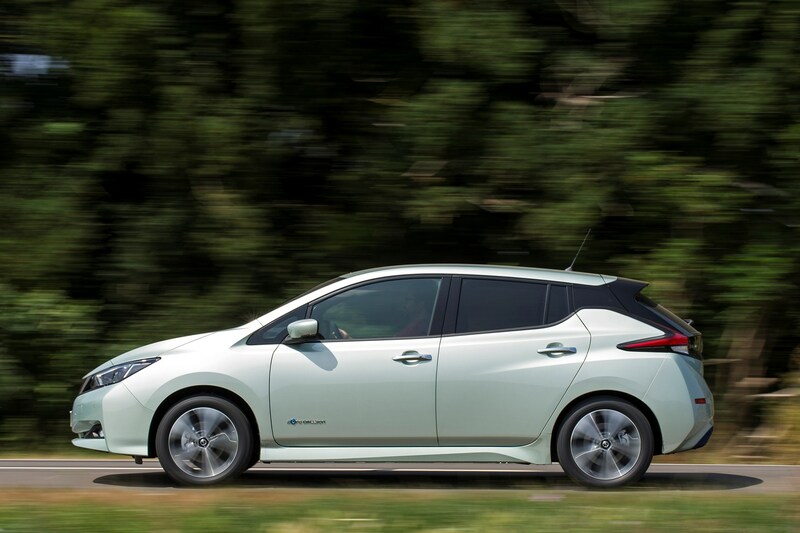 Does the Leaf’s handling live up to the performance? Sadly not. It’s not bad – and many Leaf buyers who simply want one to potter around in inexpensively are unlikely to care anyway – but enthusiasts looking for satisfaction better save up for a BMW i3. It’s a pity because the fundamentals are there, particularly with the batteries being housed low within the Leaf’s underpinnings. Bodyroll is rarely an issue if you take a bend at higher speeds. In all likelihood, you probably won’t want to, though, as there’s little communication through the light steering about what the front wheels are up to. There’s sufficient traction in most instances to keep tidy lines through corners, but you tend to judge it based on your hearing rather than the feel in your hands. How so? Well, as the whole powertrain is quieter than in a petrol or diesel car, you hear the Nissan’s front tyres chirping as they lose traction far sooner than you ordinarily might, which in turn encourages you to slow down. Sadly, the Leaf doesn’t compensate you with comfort either – take a jaunt along an undulating B-road and the lack of finesse in the damping ensures you bounce about as the Nissan struggles to contain its body movements. It’s better around town – providing the roads are smooth – but street furniture such as speed bumps are traversed with unnecessary firmness. As with many cars that have been designed with an efficiency focus, the Nissan Leaf works best when it’s driven in a careful, considered fashion. Not only does it feel more in keeping with its ethos, it means you’re less likely to stamp on the brake pedal and find them wanting. All I need to do now is figure out how to get my bizarrely proportioned self comfortable behind the wheel – but more of that in a future update. How many miles can we eke out of our Leaf by lapping Lincoln? One aspect of Nissan Leaf stewardship that’s deeply impressed me over the first couple of months is how close I can get to the official combined electric range figure of 168 miles without really trying. Covering a mixture of urban routes, B-roads and motorways, with no modification to the way I drive save for adapting to the on-off nature of the E-Pedal, typically yields a return of 150 to 160 miles before it needs recharging. That’s decent going in anyone’s book. 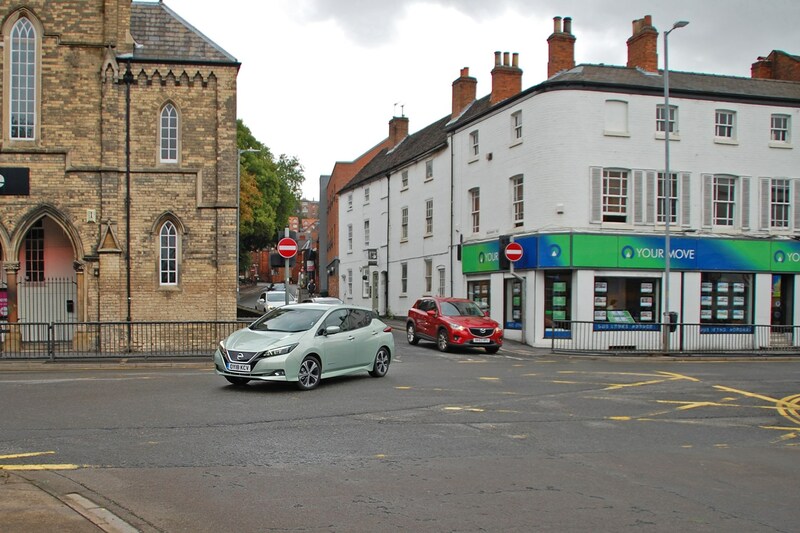 Logic therefore suggests that getting close to Nissan’s claim of 242 miles for urban driving should be achievable in the real-world, too, so I decided to put it to the test, by completing multiple laps of historic Lincoln – the nearest city to where I live. When you’re inventing a street circuit layout there are few limits about how long and complex the loop can be, but I had two factors to consider. First was the need to have a consistent lap that was short enough so as not to create pangs of range anxiety. A smidgen over three miles felt like a sensible length, so I devised a course that would pass some public charging points to use at the start and conclusion of the trial. More importantly for my second-born, Finlay, who’d been coerced into photographing the event for me, was that the lap was compact enough for him to be able to dart between different vantage points relatively quickly. The Leaf N-Connecta’s Apple CarPlay functionality meant keeping in touch with him was conveniently easy when finding out where he was pointing his lens. 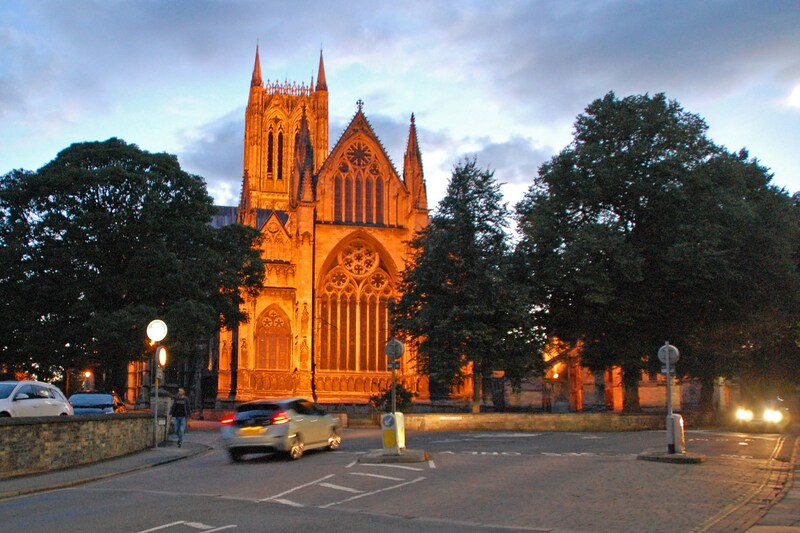 For those of you unfamiliar with Lincoln, it may be a surprise to learn that unlike much of the rest of the horizontal topography of the county, the city itself has a ruddy great hill in the centre, topped by a cathedral and castle walls. Going down those slopes should help recuperate a lot of energy, but seeing as the inclines also have to be tackled to complete the lap, it’d no doubt balance itself out. 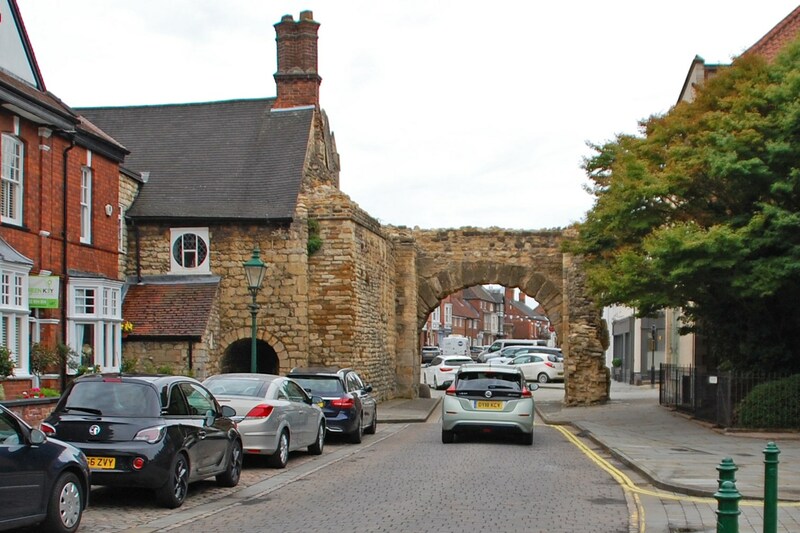 Progress wouldn’t be quick, though, as Lincoln’s traffic is frequently slow and snarled-up, not helped by the circuit also containing 16 sets of traffic lights, six give way junctions, two mini roundabouts, one full-size one, a level crossing and a Norman archway that forces traffic through one way at a time. Plus, the maximum legal speed for the whole route is 30mph, meaning it would take a gnat’s over six minutes to complete the distance over a lap if it was a straight of asphalt with no need to brake – patently, the course wasn’t like that. I was never a member of one of Baden-Powell’s clubs, but that’s not stopped me from being prepared – having enjoyed a number of long drives, lessons have been learned. Potentially I could be lapping Lincoln 80 times if the Leaf gets close to its 242-mile claim, which means quickly identifying where the toilets are located along the route is essential. Car plugged in at The Lawn car park, it was time for that other essential to be tackled, a hearty breakfast for Fin and I at the nearby Greenhouse café. Despite being over five years since I left teaching, people who know me by sight automatically associate me with the school I spent a dozen years teaching at, and so it was the case with the owner. Sadly, this didn’t liberate an extra sausage on my plate, but it was a fine start to the day. The weather on the other hand, wasn’t fine. Britain had been wilting under a relentless heatwave, but typically it was hammering down and continued to do so for the first couple of hours of the drive. Fin sensibly elected to wait until it’d cleared up before walking the route to take photos. Just after 10:00 and the Leaf’s battery was showing an indicated 100% charge, so the journey began. 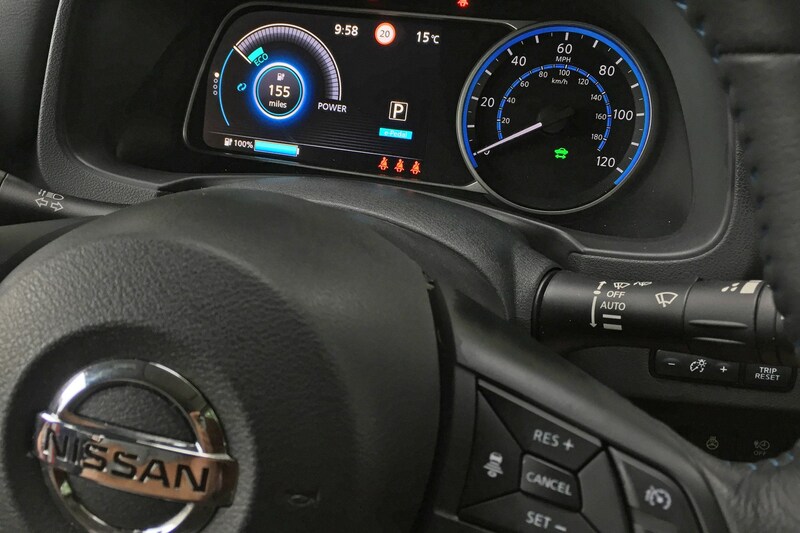 I’d decided beforehand to keep the settings consistent, which meant the E-Pedal was on, plus the adaptive cruise control aspect of the Leaf’s ProPilot system would be active and used wherever possible. Oh, and the climate control was on, with the air-con keeping the cabin chilled to 18 degrees. Not that this impressed Fin, who wanted it warmer, but the Nissan’s system is a single temperature zone arrangement. That first lap somewhat set the tone for the rest of the day, taking almost 18 minutes to complete, but more concerning was that according to the instrument binnacle, the initial tour had sapped 4% of the battery capacity. 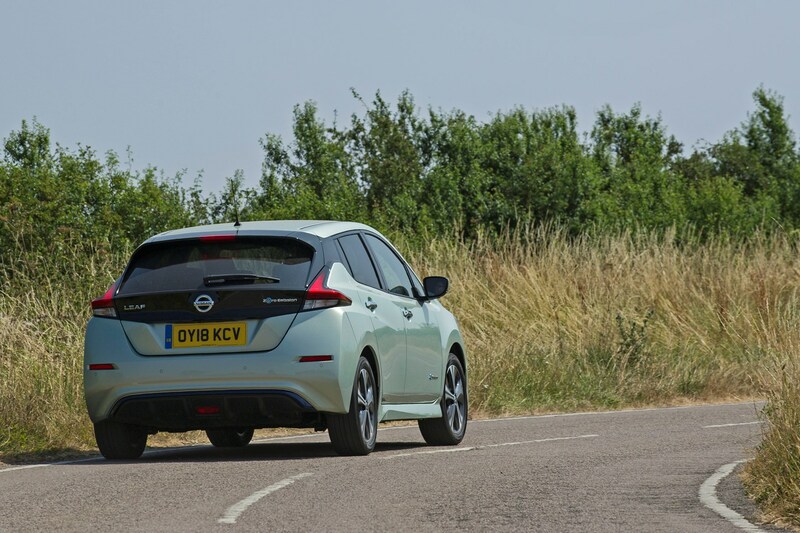 It didn’t improve either – by the time the Leaf had four slow laps under its wheels just before the first hour was complete, 10% of the charge had been used-up. 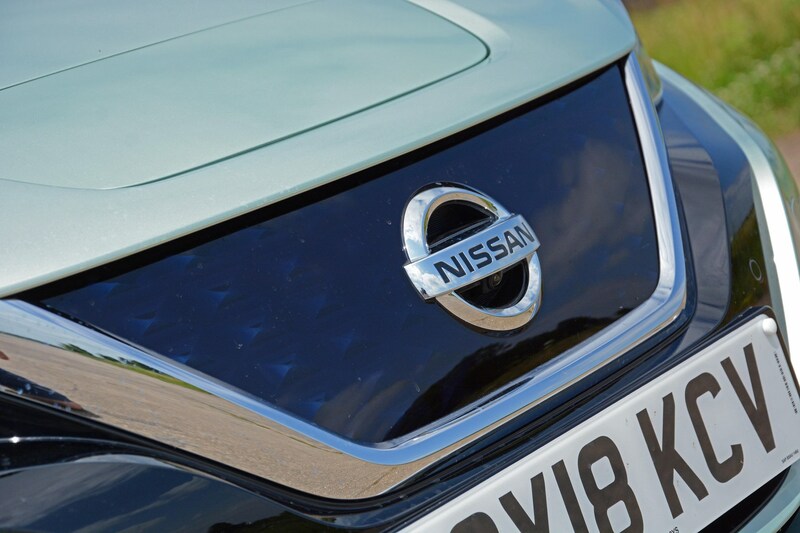 If that rate of depletion continued, I’d only cover 40 laps all day – in other words about half of the Nissan’s claimed city driving range at around 120 miles. Surely it’d improve? By the time I’d whittled it away to 80% after two hours and thirteen minutes, a total distance of 25 miles had been recorded. Not good. Time for a pitstop, a coffee and to send Fin off on foot – perhaps with just one person on board, even of my unslender stature, it might prove more efficient? Sun out and the Leaf to myself now that Fin was on foot, it was time to concentrate more on how the Nissan handled Lincoln’s streets. Immediately leaving the car park on the start/finish straight, are a series of hefty speed bumps – the Leaf’s suspension set-up certainly smoothed-off the harshness of them, but the way it porpoised over them indicates that the damping is less well-controlled than most other five-door hatchbacks of this size. Perhaps related to the weight of the batteries being so low down in its underbelly? This stretch is soon followed by a sharp decline, so I popped the ProPilot on and set it at 30mph. 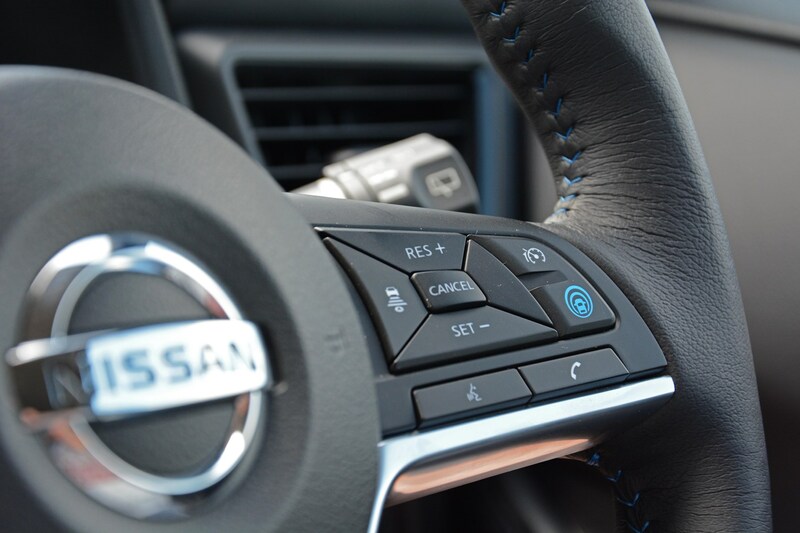 Again, other cars I’ve tried with adaptive cruise control apply the brakes on downhill runs to maintain the set speed, a no-brainer for the Nissan as it could recuperate energy at the same time. In reality it wasn’t as effective as manipulating the E-Pedal-enabled throttle was, so I quickly disregarded that option for each lap beyond that, relying upon it more as a traffic-following aid. At least in that regard it performed as desired, maintaining a set distance to vehicles in front of it, but it’s disappointingly willing to lose track of vehicles in front of it whenever they go around corners. Again, rivals’ systems appear to maintain the speed they had for a few seconds after the point of losing ‘sight’, but the Leaf immediately accelerated back up to 30mph, meaning I’d have to manually brake myself to tackle the same corner, before re-engaging ProPilot when the car in front was visible. A bit of fine-tuning wouldn’t go amiss there to reduce the clunkiness. It’s not all bad news, though. Thanks to maximum torque being instantly available from a standstill, the Leaf’s satisfyingly punchy away from traffic lights – on parts of the route where two or even three lanes of traffic were adjacent at the lights, the Nissan was only beaten to 30mph once, inevitably by a Tesla Model S.
Power delivery is smooth and linear, too, further benefitting urban progress without a turbocharger spooling-up and creating a burst of acceleration. Even climbing back up the hillier aspects of the lap didn’t seem to faze the Nissan either, feeling almost as eager as it did on the flatter sections. There’s a lightness to the controls that aids urban driving, too, particularly the steering which is easily twizzled left and right to make negotiating Lincoln’s tighter streets all the more effortless. Plus, because the transmission is a single-speed, with Drive essentially selected like an automatic, there’s no tiresome left-foot clutch operation, rowing a manual gearlever to and fro. But how’s the efficiency going? 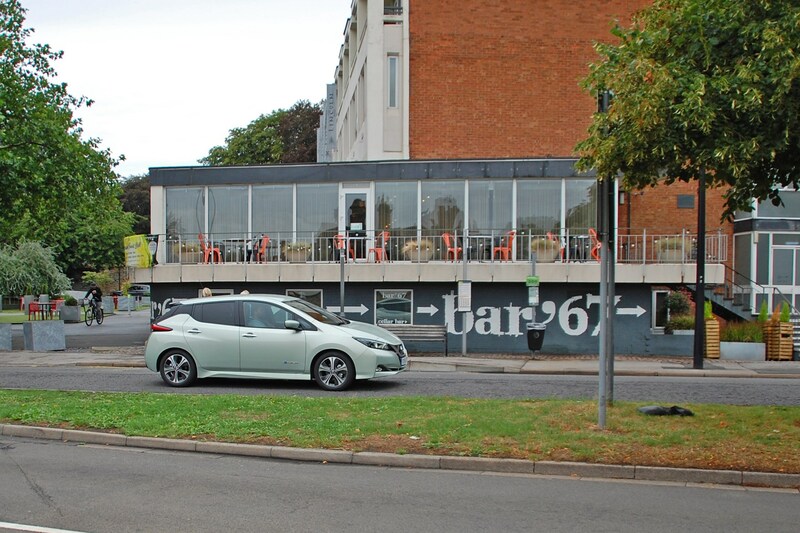 Sadly it still wasn’t great and by the time I’d picked Fin back up from his pedestrian lap of Lincoln and parked up to have a late lunch, only 60% of the battery capacity remained, yet the Leaf had only managed a total of 47.6 miles, at an average speed of 10mph. Not only was it proving to be a less efficient journey than my usual commute down the A1 at considerably higher speeds, rush hour traffic was beginning to congest the route more seriously, meaning some sets of traffic lights cycled through two or three times before there was a gap to slot into. Sustenance and a break were equally desirable at this point, if only to give myself some time to reflect on why the Leaf was proving so ravenous in terms of chewing through its electrical reserves. Each of the 16 laps so far driven was consuming an average of 2.5% of the battery capacity, yet if the instrumentation was to be believed almost all of it was used on the inclined section of the circuit. 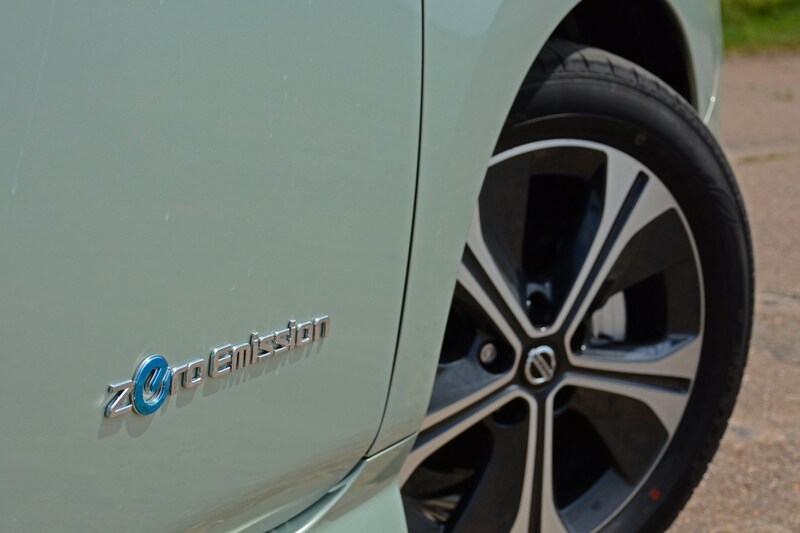 Unlike a petrol or diesel car where it becomes lighter the more fuel is burnt off, the Leaf remains the same, so there’s no efficiency gain there. Surely it can’t be the E-Pedal – after all, that’s about recuperating energy that would otherwise be lost. Could it be cramping its overall efficiency, though? Over a sausage roll and a slice of lemon drizzle cake, I decided to continue as before for the rest of the drive, the only change being to turn off the climate control and drive with the windows down for ventilation. Back behind the wheel, climate control switched off and the grand total of an solitary extra mile of range was liberated as a result. Still, having the windows down was certainly a refreshing experience, with little in the way of in-car buffeting at such a low speed. It was also a welcome distraction from what was becoming rather a monotonous journey. 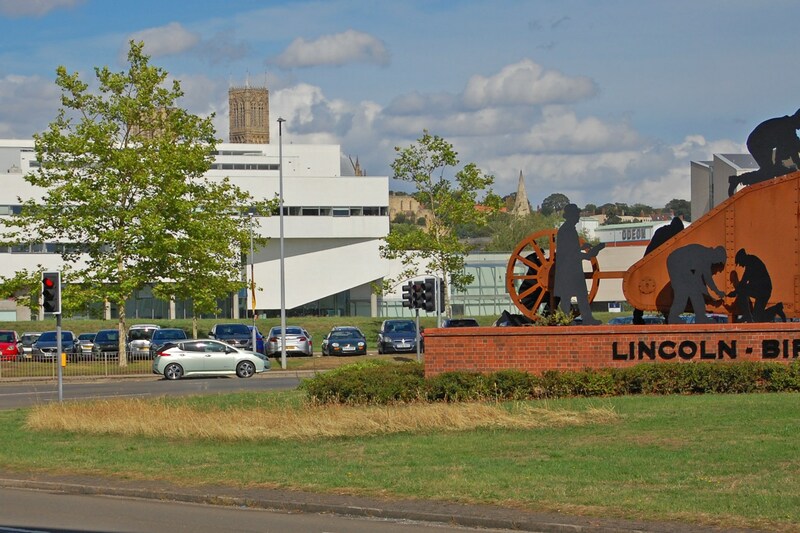 Don’t get me wrong, Lincoln’s a lovely city and somewhere I’ve lived in or close to for almost four decades, but trundling along the same route time and time again does become dull. Even accidentally picking up the wrong lane for a left-hand turn failed to deliver much excitement. It's a similar story with the Leaf itself – it’s worthy, but it doesn’t exactly stoke your coals. Because it looks far more like a conventional petrol- or diesel-engined hatch, it’s lost some of the other worldliness of the Mk1 Leaf, giving it more of a universal appeal. It’s an electric car for people who wouldn’t have considered one before, hence its ordinariness is deliberate. By now, the daylight was beginning to fade to a sufficient degree that in more shadowed part of the route the automatic headlights would come on with an accompanying bong from behind the dashboard. It was a dashboard I was trying to pay only scant attention to in order to avoid clocking the battery reserve… but when I did, I spotted it was hovering at 30% and only 78 miles had been covered. This wasn’t going anywhere near as well as I’d hoped. 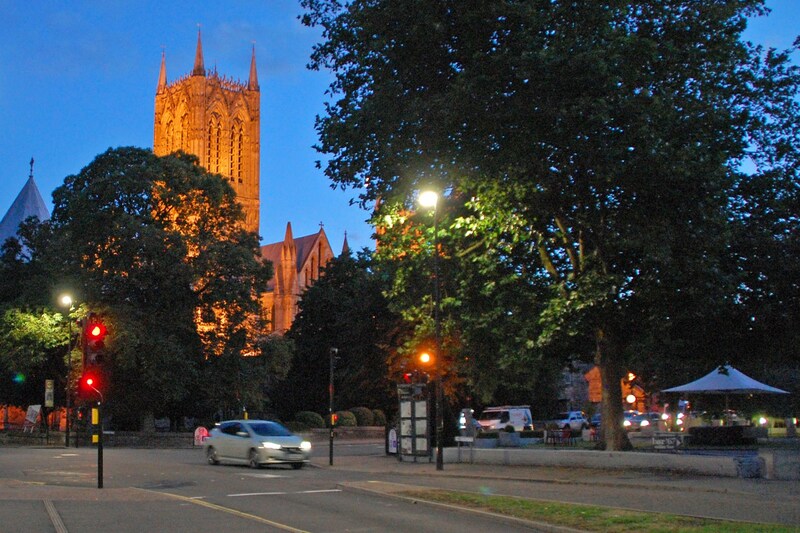 Despite being late summer, it’s not too far into the evening before the Leaf’s lights are permanently on, almost an hour before the street lights followed suit. It was also starting to feel muggy, so the climate control was called into action, the chilling effect of the air-con being deeply satisfying. 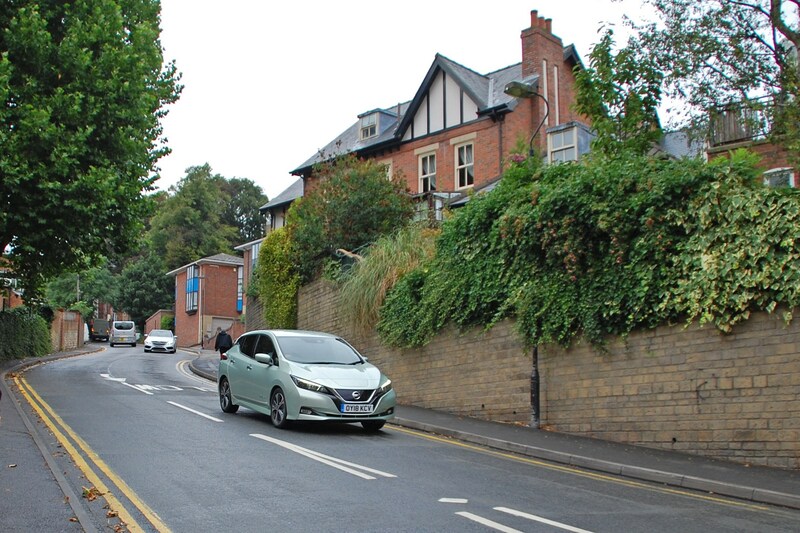 Our N-Connecta grade Leaf doesn’t have the range-topping Tekna’s full LED arrangement, but that didn’t prove to be notably detrimental on the city’s roads, although the difference is more obvious on otherwise pitch-black country roads. 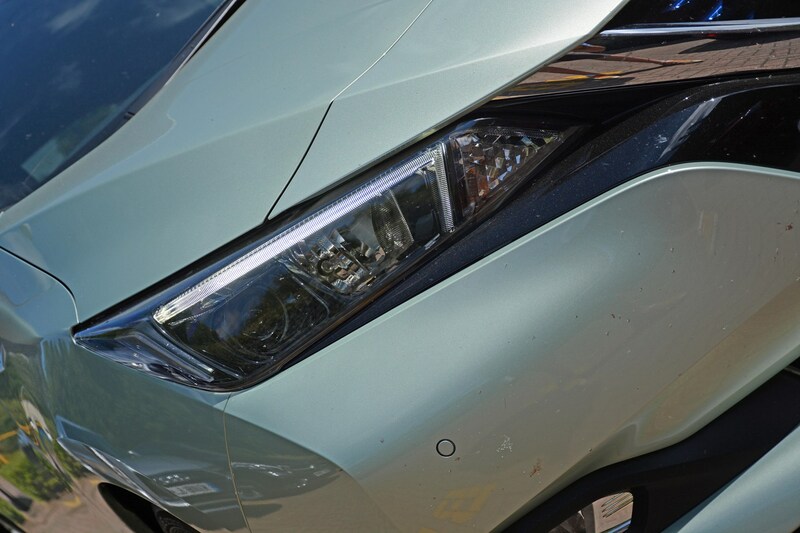 There’s an automatic main beam function, too, which seems to work reliably and accurately – so far I’ve not had a flash of ‘oi’ from an oncoming car when I’ve driven the Leaf at night. As the volume of traffic began to subside dramatically compared with the busier spell late in the afternoon, the average speed slowly crept up, with shortening lap times as a result. 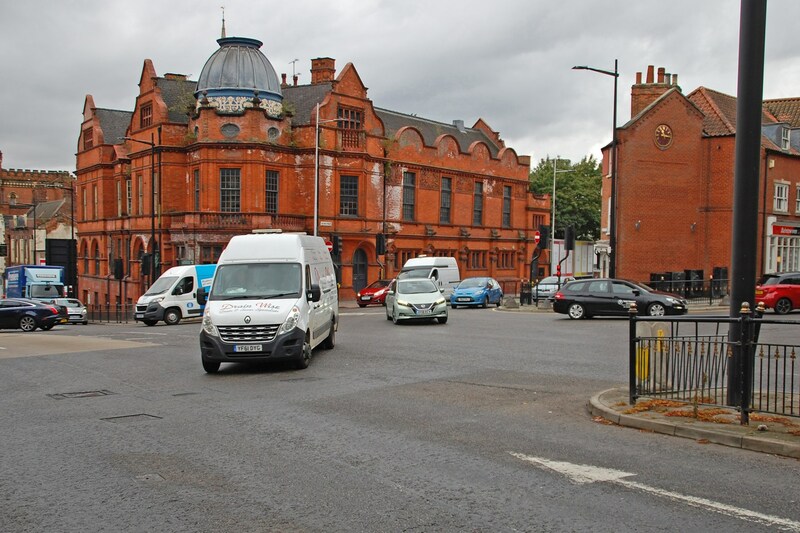 One lap was especially successful, with all barring two sets of traffic lights at green as they were approached – it was the only 12-minute lap of the day, the joy of which was short-lived as the next lap was stymied by a freight train passing through the city centre. By now Fin was back on board from his brief break to take some dusky shots, but it was clear that the driving adventure wouldn’t last much longer. In all honesty the sadness of realising that the final mileage tally was going to be low was tempered by the fact that I can’t get truly comfortable in the Leaf – a situation exacerbated by a ratchet mechanism for adjusting the seat angle and a steering wheel that can’t be manipulated for distance. A pity because the seat itself is decently comfy. With 9% of the battery capacity remaining a ‘charge now’ warning message appeared in the instrument binnacle. This is as close as an electric car gets to the way a petrol or diesel car will cough and judder as the fuel supply begins to run out. 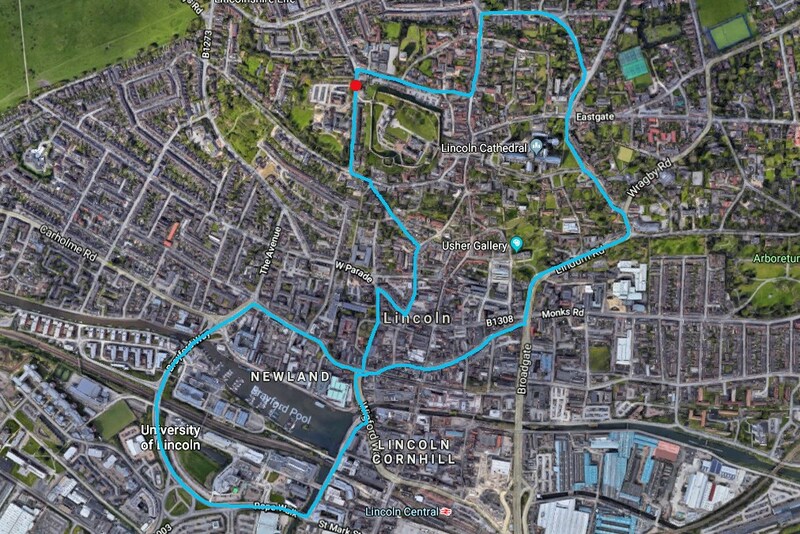 We decided to press on and try for two more laps – a third would have seen us at the wrong end of the city centre, with a steep hill to climb, and after almost 10 hours behind the wheel that wasn’t a fitness test I was prepared to attempt – and fail. 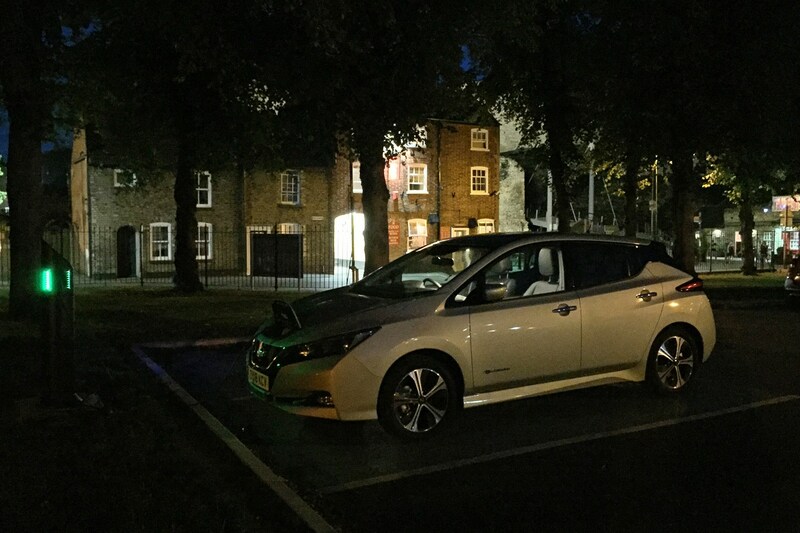 Those final tours completed, at just before 22:00 and with 1% of the Leaf’s range remaining, we returned to The Lawn car park to get enough juice back into the Nissan in order to make it home. It was time to take stock. 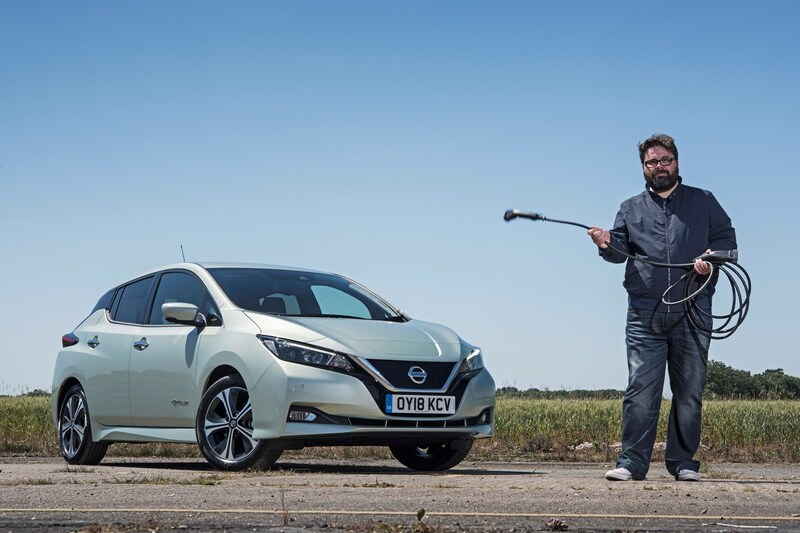 After 10 hours and four minutes driving, with an average speed of 11mph, the Leaf had covered a disappointing grand total of 116.6 miles – that’s 125.4 miles short of Nissan’s claimed city driving range. Surely I must have done something wrong, inadvertently hampering the Leaf’s efficiency with all the stop-start, low-speed driving? After all, why would it be significantly more efficient driving at higher speeds on my commute down the A1? Was it the E-Pedal? Or the ProPilot? 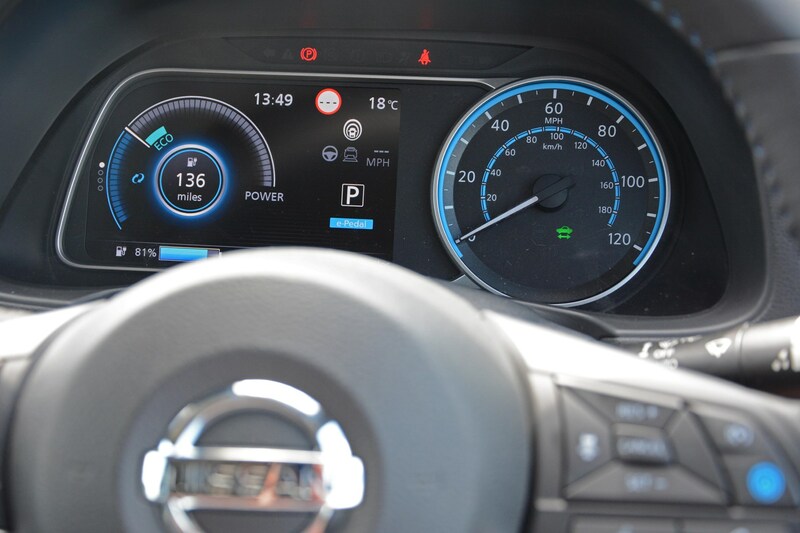 Answers to these questions and others will be posed to Nissan as I endeavour to find out how to drive the Leaf more efficiently at urban speeds. What’s particularly disappointing is that battery electric vehicles (BEVs) offer a viable, zero-emission future in towns and cities. 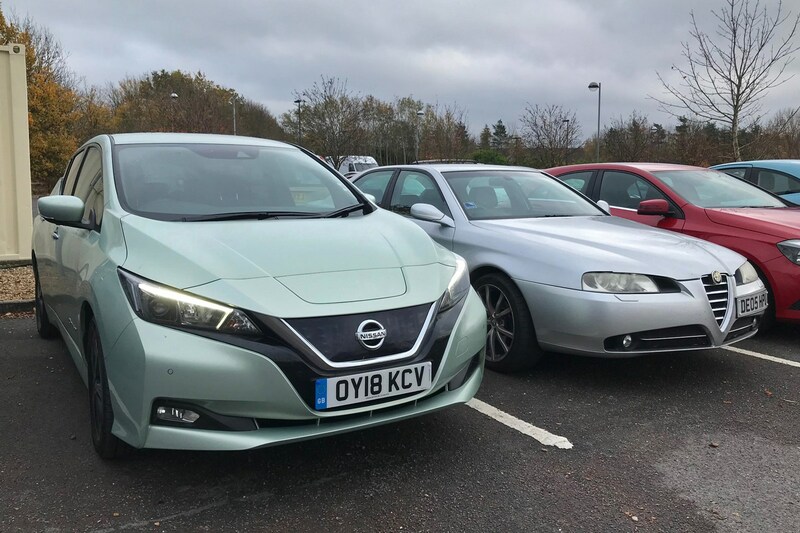 Even though the Leaf offered a 36kg CO2 saving compared with a petrol-engined car of a similar size, if the range is compromised so badly it will inevitably put people off considering swapping to one. Or will it? You see, there’s still a cost factor to consider. 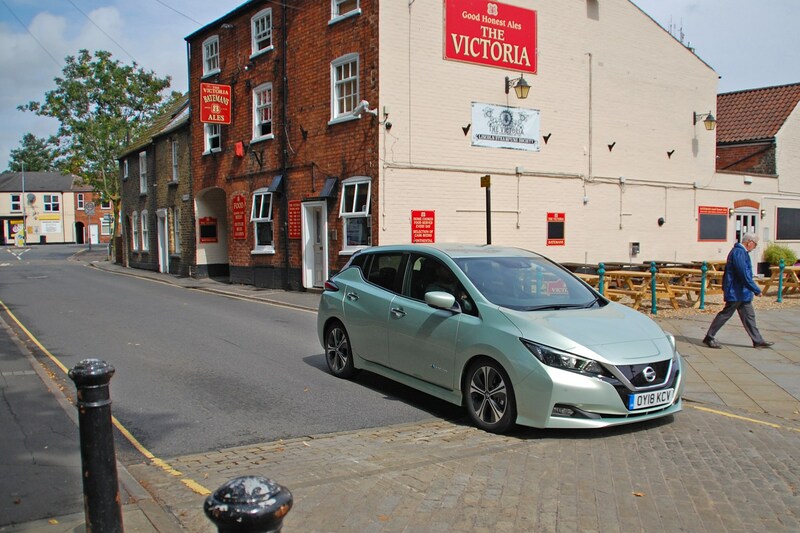 While the 116.6-mile tally was much lower than expected, the cost of the electricity the Leaf used for the trip was just £4.42 – see how far you get if you spent that amount on petrol or diesel. Not a convincing performance by the Nissan on this occasion, then, but it’s a scenario I’ll endeavour to improve upon in the coming weeks. 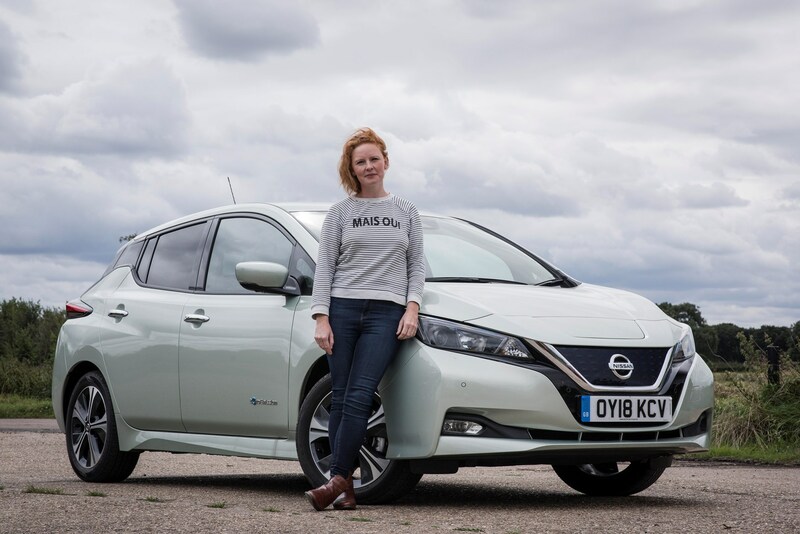 Freelancer Clare is considering an electric car - will the Leaf persuade her to switch? I have never been an early-adopter and am generally late to the party when it comes to new technology. I’ve only just got a TV, for instance. So when offered a chance to test the Nissan Leaf, I thought it might make me appear cooler – on Instagram, at least. Not so much leaf-coloured, it’s more minty fresh in its appearance, its regular custodian Keith had kindly charged it up before coming to collect me from Peterborough town centre. Keith had parked in Waitrose car park, which, having not purchased an item from the store, contravened their parking regulations. Even though it was my first time behind the wheel of an electric car a quick getaway was needed. I wasn’t taking any chances with the Waitrose parking police: they probably wield avocadoes instead of truncheons and those stones can be lethal. The space was tight – I wouldn’t have parked there if I’m being honest – but once I’d sort of lurched forward, nearly taking out one man and his manchego, it was all systems go. The driving experience was a smooth one (my passenger is entitled to his own opinion) and being an automatic made it simple to operate. I was impressed at how quickly it got up to speed – it’s so nippy! I actually felt pretty cool driving the Leaf and that evening I parked outside my new house ready to show off to the neighbours that I was CHARGING A CAR UP OUTSIDE MY HOUSE. Go me. Unfortunately, the cable supplied wasn’t quite long enough, but unperturbed I used an extension flex, lifted up the charging hatch and inserted the plug. It made all the right noises and the lights on the dash flashed-up. Would that suggest to you it was working? It did to me, so I walked back in the house and started contemplating a Leaf as a second car. I knew it could save me a lot of money and I loved the idea of not having to go to a filling station where the temptation of buying a grab-bag of salt and vinegar Discos is often all-encompassing. This way I would be healthier and, by choosing a car with zero emissions, the world would be, too. After a few hours, I headed back outside and unhooked the charger. During this time I’d answered several questions on Instagram from friends who were intrigued by the Nissan, wanting to know if it really was all-electric. So I, err, powered-up (is that the phrase?) the Leaf and looked excitedly at the screen to see how much charge I’d now got. How amazing was this? Such joy! Then I saw the little icon that indicated the battery level. It was the same as when I’d plugged it in. Gutted. And also embarrassing following the smug post I’d Instagrammed showing it charging outside my house. I later discovered that electric cars tend not to charge if an extension cable is used. You probably already knew that, but I’m not afraid to look like a twit if it saves you the bother. Still relatively undefeated, I decided to find a Chargemaster facility using Google Maps. The nearest one to me was at a new housing development that was still being built. All of the other locations were too far away for me to reach in my lunch break. I pulled up and read the sign ‘for visitors to the development only’ which didn’t bode well. I felt I might need to pretend to visit the show home in order to justify pilfering the electricity. 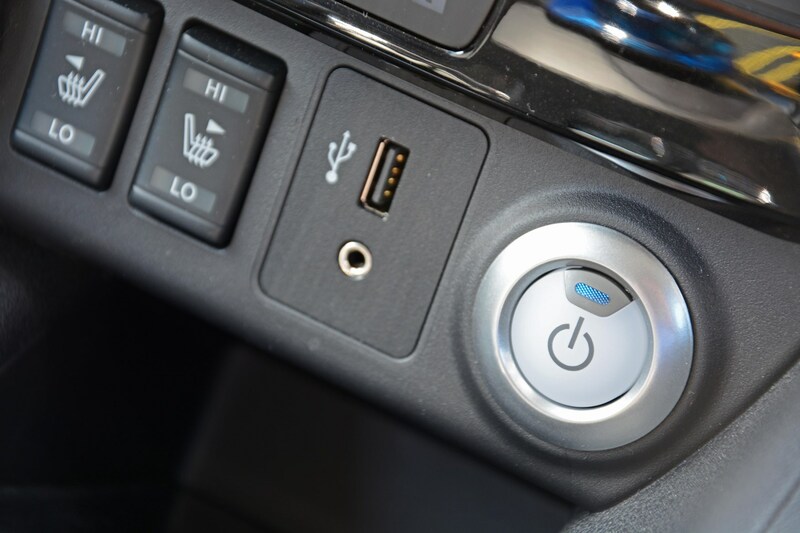 Plugged-in, the flashing icon on the dash once again indicated that charging was happening. We were in business! I made a couple of little videos to pass the time detailing the process and adding the cliffhanger ‘I’ll let you know how I get on…’ before ending with thumb over the camera lens. Half-an-hour later, car back on and… I’d gained just 1%. I fell out of love instantly. Keith asked what I’d done because it always worked for him. Frustratingly, I knew I’d done everything right – it must have been the electricity feed to the charging point itself that was dodgy. I felt a bit sad. I really wanted to love this car – and I did enjoy driving it – but I need to be able to go places in it, not just have it parked-up like an ornament. If I was buying one it’d obviously be different because I’d have a proper charging point on the side of my house, but I was put off as an occasional user not being able to do that. 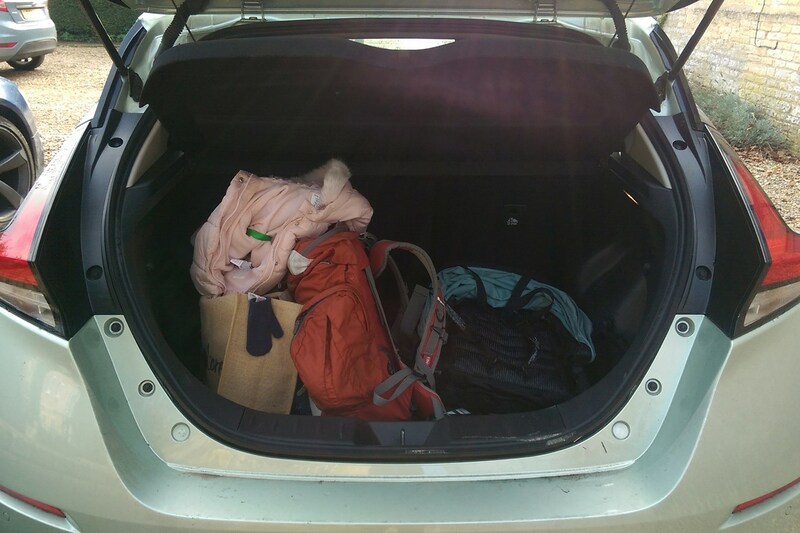 Maybe I needed to be a lot more organised – electric cars require a change of mindset and I was simply going about things the way I do in my Passat. 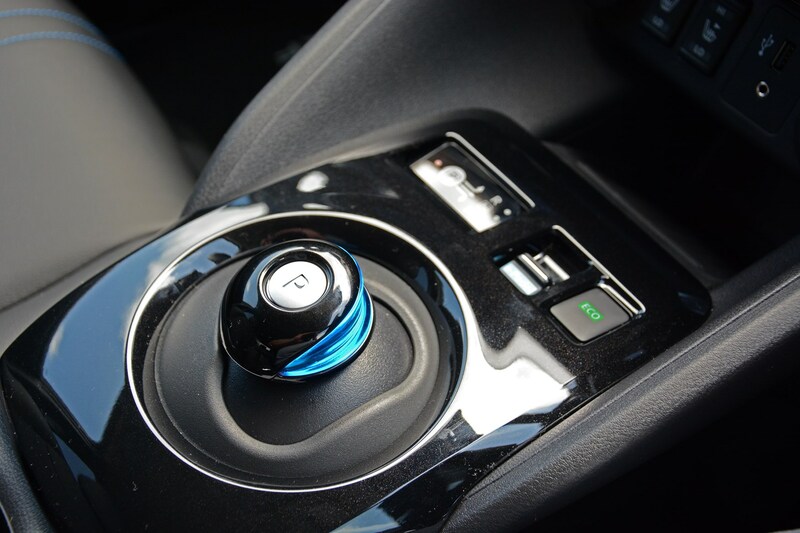 That said, there’s no getting away from the fact that it’s a zippy little thing and is really easy to drive – funny gear selector thingy notwithstanding. And it’s cheap to run, too – I covered over 130 miles using less than a fiver’s worth of electricity in the process. I felt like a hero when I was driving it, a world-saving hero – I just need to sort out my charging logistics before they make me into a movie franchise. It’s fair to say my friends were surprised to learn I’d be picking up the keys to Parkers’ long-term Nissan Leaf. After all, my automotive passion tends to be measured in gallons per mile. Aside from the new Polestar 1 coupe very little electric-propelled has piqued my interest from an enthusiast point of view. Instead, I persist with Bangernomics. My daily driver is a £700 2005 Alfa Romeo 166 Ti, and though neither the fastest nor the most gadget-laden machine, it’s refined, stylish and interesting to drive. 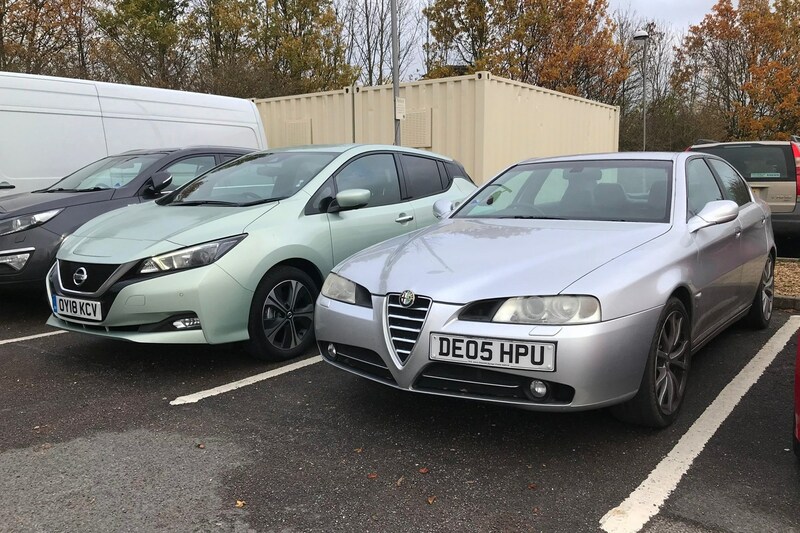 But I also have an Alfa Romeo 147 GTA as my weekend fun car, so I need to save cash on the daily commute. Though a daily driver that’s fun as well is good, the 22mg my 166 coughs-up carrying 1600kg of bodywork – plus me – from its comparatively tiny 2.0-litre four-cylinder motor provides some food for thought. What I really want is a Maserati GranSport. A 4.2-litre V8 that is about as eco-friendly as firing burning polystyrene into the upper atmosphere by use of ignited CFC gas, but it ticks all my automotive enthusiast boxes. Alas on my current stipend the £30,000 entry price is beyond me, so what if I could save a shedload of cash on the daily commute to further my chances of adding a trident-badged coupe to my fleet? Silly? Not really. For the electric car movement to really move on and gain traction among the mainstream, making people feel bad about emissions isn’t going to be effective on its own. Appealing to their wallets will. The same applied to diesels – no one really wanted an oil burner, but they did want the fuel efficiency. Oh! And there’s something deliciously mischievous about using an EV for the sole reason of off-setting buying something that consumes the earth’s resources with the tenacity of a gannet. So, with a genuinely open mind I received the keys from Keith WR Jones, and he showed me around the Leaf’s various bits and pieces. For someone who’d never driven an EV it was a lot to take in at once, but it all made sense fairly quickly. I’d also came to an equally speedy conclusion regarding the looks. This is, of course, a subjective matter, but they’re a complete turn-off for me. 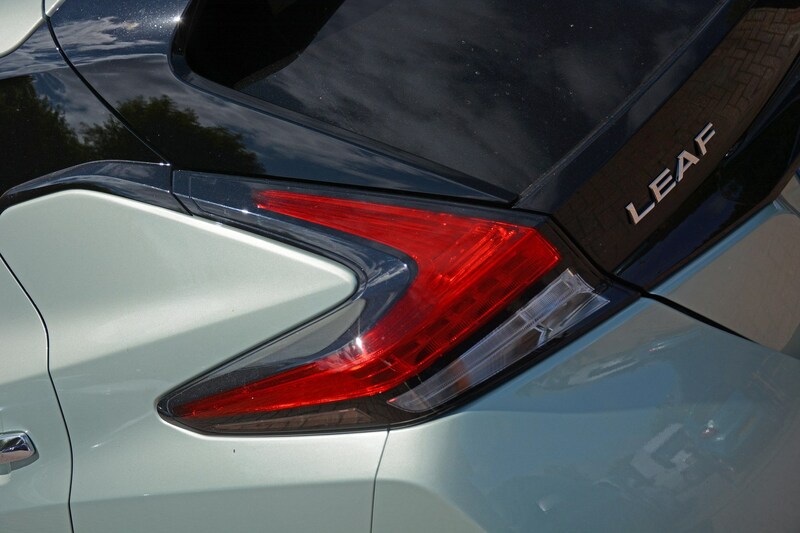 I drive/put up with my 166’s foibles because it is subtle and stylish… and the Leaf just isn’t. It’s a clusterfuddle of lines, curves and odd proportions that don’t really work. Perhaps that was just me – after all, I have weird tastes when it comes to styling and perhaps they’re out of date. I love the Alfa Romeo SZ, after all… Nevertheless, upon arriving home with the Leaf my wife enquired as to why there was a large blob of phlegm on the driveway. My greyhound Willow was similarly bemused. Subjective views about its looks aside, it did the trip from office to home reasonably well. It’s smooth, well-damped and though like most modern cars its steering feel was rubbery and vague, the driving element worked well. No, not as fun as my 166’s Twin Spark revving to 7,000rpm, but then that’s not the point (and probably explains the Alfa’s terrible fuel consumption…). There were more pressing problems with the ergonomics, however. Because the batteries are under the seats, you’re hoisted into the air. Unfortunately, nobody told the dashboard. At 6ft7 I’m hardly a typical human, but I simply couldn’t get comfortable. The steering wheel wouldn’t go any further up than it already did, and the seat didn’t go back as far as it should have done. Again it could have just been me, so I got my Modern Classics supremo JJ Vollans to try it, as he’s a bit more normal-shaped. He had the same problem; shins and knees hitting brittle plastic and a tiring arms-outstretched driving position. JJ and I had a trip in mind for the Leaf. We needed to pick up a Lotus Elise for a photoshoot, around 65 miles away near Retford. Okay, so our reason for going might be a little out of the ordinary, but it’s not out of the realms of possibility that a Leaf owner might want to go on a holiday or see a relative a similar distance away. With a range of around 140 miles on the Leaf, I thought I’d be fine to get there and back. I wasn’t. As I waved goodbye to JJ I ruminated on my remaining 37 miles of range, and fired-up one of the charging apps that Keith had suggested I use. Hmm… no mobile phone signal, no connection. Disappointing, but the Leaf has sat-nav that lists places to charge up. It’s a good system, in theory, but seeing as it couldn’t find my postcode, it didn’t instil much hope. Yes, my home is a new-build, but it’s five years old now, and this is a brand-new car. Of course, I could just use my mobile phone, but if that’s the case why bother with the sat-nav in the first place? And if my mobile’s got no signal, what then? The Leaf chirped-up with a list of charging points, but at 16.30 on a Wednesday evening I wasn’t sure which ones were open or not. I plumped for Blyth services – further north by 12 miles or so, but I knew for sure that charging points would be there. When I arrived I was confronted with Ecotricity’s Electric Highway facility, necessitating another app sign-up. I was rewarded with a notice telling me that my car wasn’t compatible. With just 24 miles left of range on my wagon, and not having a great deal of choice in the matter, I inspected the connector. Well, it matched my car… perhaps the system hadn’t been updated to the new car? So, I plugged it in and hoped for the best. It appeared to be charging so I went off to endure a service station for 45 minutes. Screaming children, screaming adults, terrible food (which I may have partaken in) and very little to do unless you like slot machines, spending the evening at Blyth services is among the things I’d like to do least. In the meantime I checked out Twitter. Apparently the Electric Highway had broken at Peterborough, according to my fellow car hack scribes. I returned to the Leaf and found that I’d been blessed with more miles. Seven. A whole seven extra miles. With Peterborough 60-odd miles away, this wasn’t good. I tried the app again, which for some reason had forgotten my account since I last used it. So I signed up again, and selected the nearest PodPoint. Which was 0.0 miles away, at the Travelodge. Ah, excellent. Except it wasn’t. There was no PodPoint. The next nearest? A hotel and spa eight miles away, but clicking on it for directions repeatedly crashed the app. The next nearest free charging facility that was open was located at Doncaster Lidl, a further 12 miles north. As the app directed me there, JJ chirped up to thank me for dropping him off, and that he was now home. It was now around 18.30. No disrespect to Doncaster residents but a Wednesday night at Lidl is not something I’d ever aspired to. Still, at least it had toilet facilities. Facilities that hadn’t been cleaned in a while; and as I watched my leather jacket (an expensive gift) bellyflop into the stagnant urea on the floor – there was no hook – I ruminated that perhaps you really had to be an evangelist to consider an electric car at the moment. It’s not exactly glamorous. Still, at least it was charging and, after about an hour, I’d be able to get on my way. I programmed the sat-nav, set-up the Bluetooth audio for some Blocks & Escher (I was in a particularly angry mood, unsurprisingly) and turned the heating on. After a confusing lap of Doncaster’s one-way system – thanks again, Leaf sat-nav – I was on the A1, at a steady 70mph; exactly how I’d use my 166. It was going fairly well, and with smooth silent running from the car and the pleasingly thumpy stereo to ease my mind, I started to think more seriously about this car. It’s argued that these trips aren’t what this car’s for – it’s designed for inner-city commutes. And that would be a valid argument – if it was £10k/£12k, like a Suzuki Ignis. But it’s not, it’s £26k+ as tested and that’s far, far too much for a car of such limited abilities. You could buy an Ignis for town duties and spend the rest of it on public transport and hire cars for longer journeys. It’s a bit like owning a dog but only being allowed to let it run in the house. Soon I was being dogged by another worry. 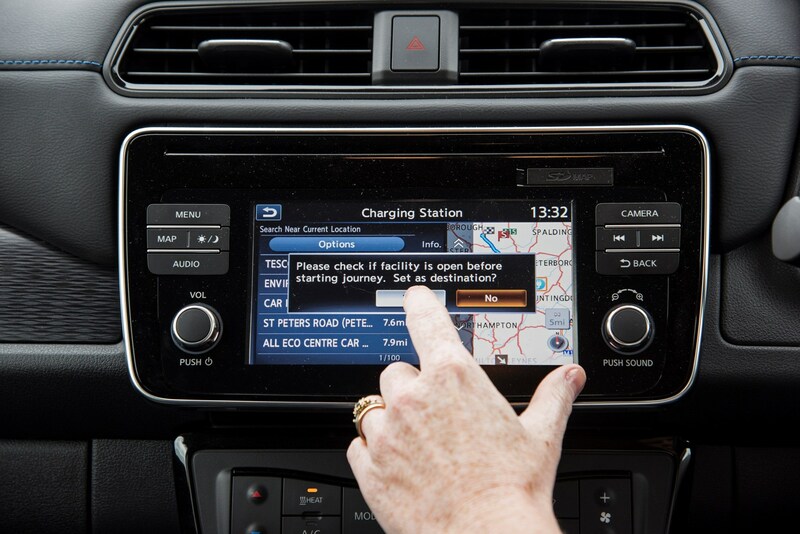 The 142-mile range to 83-mile sat nav had soon turned to 37-mile range and 35-mile sat-nav, and dropping further. I quickly turned the heating off, giving me an extra few miles of range, but not enough. I ended up slowing to 45mph on the A1, in the dark, shivering, with strong back pain due to the driving position, just to make sure I made it. I eventually pulled into Parkers HQ at around 22.30. Defeated, I sought out my 166. I’ve never been more glad to sink into my Alfa’s plush leather chairs. As a method of propulsion, the electric car works – as long as you don’t have the temerity to have the heating on – but it is the infrastructure that’s really at fault. You really have to be sold on the EV lifestyle to enjoy the Leaf. And I’m afraid I’m not there yet. Rarely am I caught out by the size of my back end, but my first time in Parkers’ long-term Nissan Leaf made me realise how tricky it was to see when I swivelled my head. 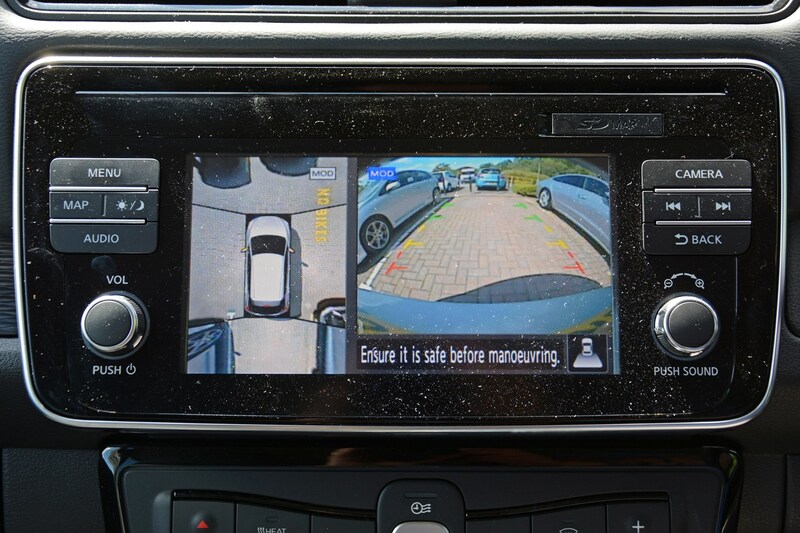 However, it was only a minor gripe given the 360-degree camera assistant – read: parking assistant. That initial trundle home from the office confirmed that the Leaf was simple and intuitive to drive. Even the overwhelming sensation of smugness generated from my (tailpipe) emission-free driving outweighed the clunky factors such as climate control that took an age to heat-up and seat ratchets that are perfect for not being able to adjust the driver’s chair to exactly where you want it. For my first long journey with the Nissan I ventured along my oft-travelled path from Stamford to Lincoln. Despite driving at 60mph most of the way, the battery reserves dropped from 91 to 56%. I decided to keep it in Eco mode, which was a bit like being weighed just before and after a boozy Christmas dinner – a little heavier to handle, with a bit less control and a lack of oomph. 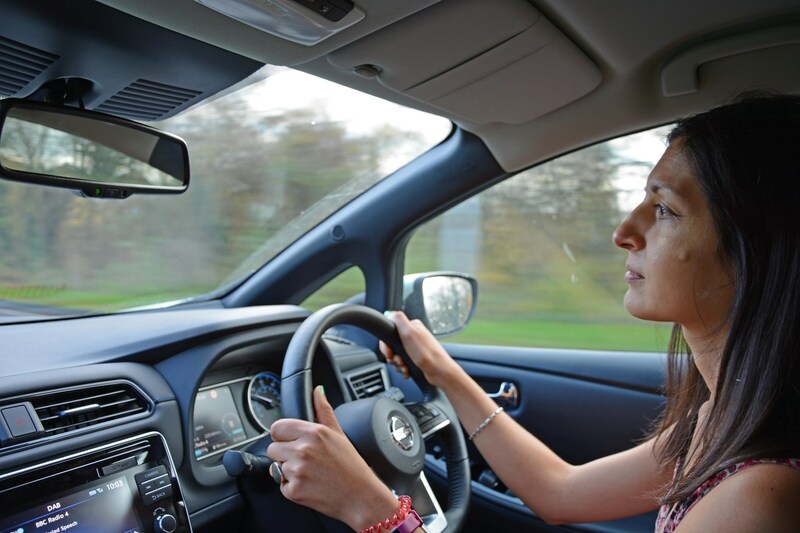 As it’s so easy to drive, it allowed me to appreciate features I’ve not come across before in other cars: I discovered that I liked the tiny light on the door mirrors telling you that a car is in your blindspot – something I never thought I needed until now. 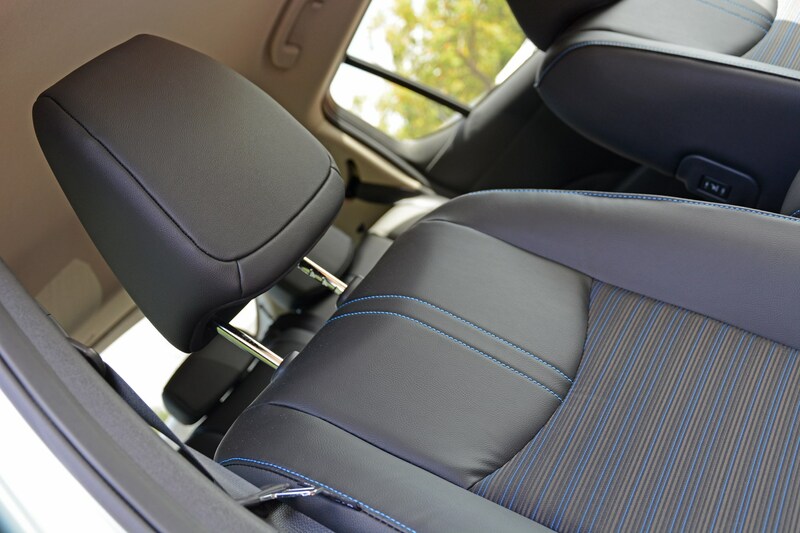 Similarly, heated seats that radiate warmth all the way up your back are a novelty, too. 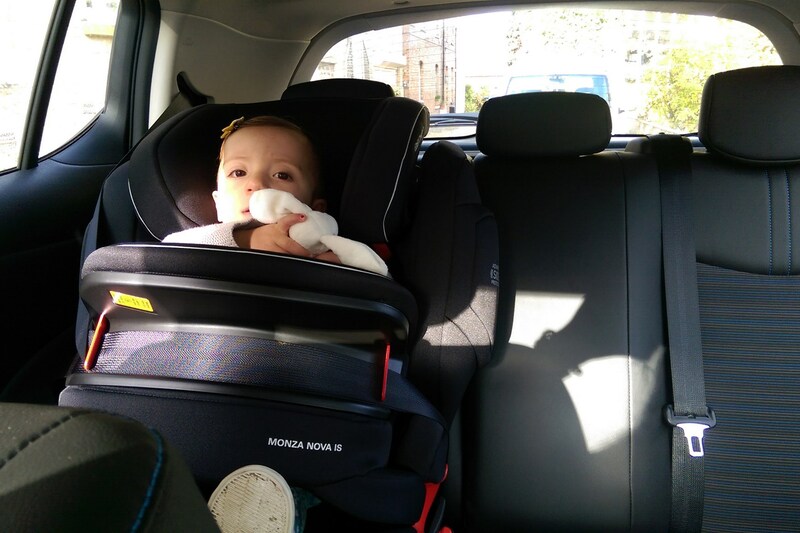 Interestingly, my daughter fell asleep almost instantly, so clearly she doesn’t need the grunt of my usual Volkswagen Golf R to entice her into Kipsville. Before my journey home I rang ahead to the nearby Nissan dealer to arrange to use its charge point. Not that I needed to it transpired, as there was a free space anyway and no pressure to come back in a rush. My journey back was fine, albeit with continued climate control frustrations. 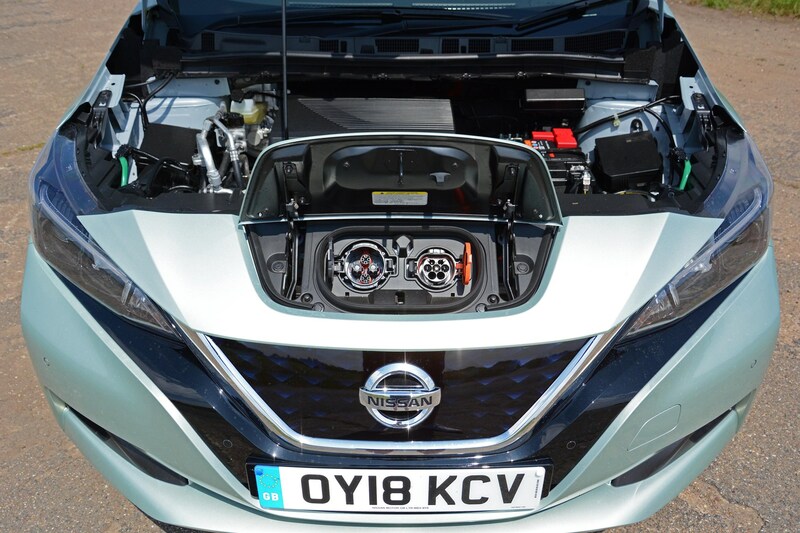 I also started to play around more with the Leaf’s different modes with varying levels of brake-energy recuperation, setting on ‘B’ for the transmission with the E-Pedal switched on – it felt more conventional than the others, which doubtless will help people make that transition into electric cars. When the old man got in the Leaf for the first time there was the inevitable 20 questions, followed by eagle-eyed watching of my driving techniques, while pushing every button on the dashboard to try and find fault. 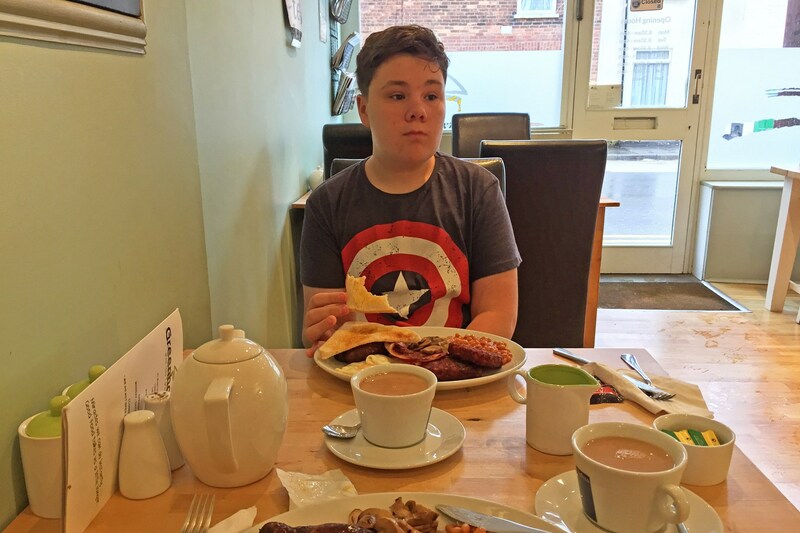 He couldn’t find anything that displeased him – in fact, he begrudgingly confirmed that he was relatively impressed. Job done! Another pleasing, new-to-me feature was discovered when I went out after dark: automatic full-beam headlamps. If, like me, you’re uninitiated, they dip when another car ahead was sensed. How polite, and very in-keeping with how I perceive a Japanese car ought to be (and yes, I know the Leaf’s built in Britain, and of course I’m aware this isn’t a Nissan-only feature, but still – I like). A few days in to my electrification familiarisation, I experienced a new feeling: electroguilt. This is the emotion felt when you plump for a petrol car only to arrive at your destination to find five unoccupied charging points, all ready to use. Electric cars really are an all or nothing approach, I feel. Later on, when the mother-in-law stepped into Leafie (as no-one else should be calling it due to its naffness) and following her 180-degree inspection of the immediate surroundings, she melted (literally) into the heated seat and was astonished at the smoothness of journey. As I parked-up, she made a couple of observations: when I’d earlier driven downhill, the silence from the Leaf was in-line with her expectations, but watching me reverse up a slight slope perplexed her due to the complete absence of a revving engine. It’s not just the physical act of driving that takes a little getting accustomed to in an EV, there’s the aural factor as well. Would I choose an electric car next time around? You know what, I think it would, not least because an EV would suit my incessant need to plan everything – so I can simply add ‘check battery life’ to this list of to dos. For me the Nissan Leaf comes into its own for shorter 10-15-mile commutes, as the easiness of driving it makes it great around town. My biggest bugbear? Constantly feeling like an evangelist, as there are many more sceptics out there than you’d hope to encounter. I felt like I was permanently selling the Leaf’s virtues, but without the pay cheque from the Nissan PR department at the end. I’m not awestruck by the styling, either – it gathers looks of bemusement on the mean streets of an archetypal middle-class town in a rural county. And I get that: just looking at the tail lights and you count ten different angles before you reach bumper. That’s a lot of detail. Also, electric cars are becoming more popular, but the charging facilities are yet to catch up – not in sheer numbers, but in the variety of their locations. But with all that in mind, I can’t fault the drive and the exhilaration of beating a souped-up petrol car off the mark due to the rich seam of pulling power to mine. Plus, we all need to start driving electric soon if we are to opt for prevention, rather than a cure. See? Instant evangelist… Gah!